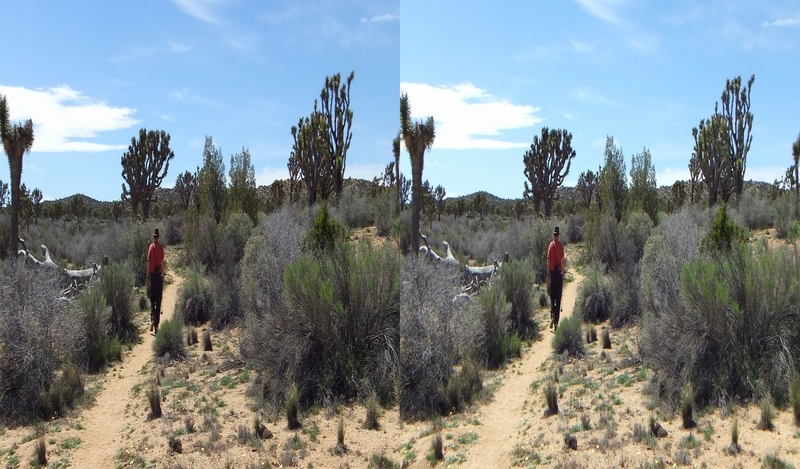 Trek date: 2016 Mar 25. 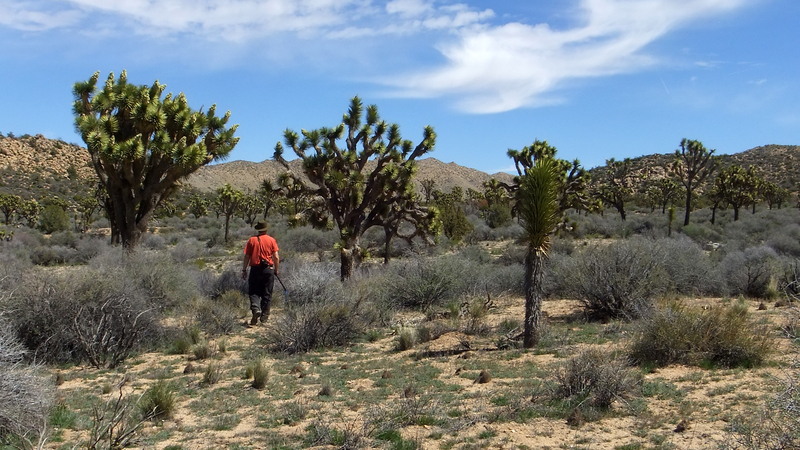 Explorers Murbachi & E! 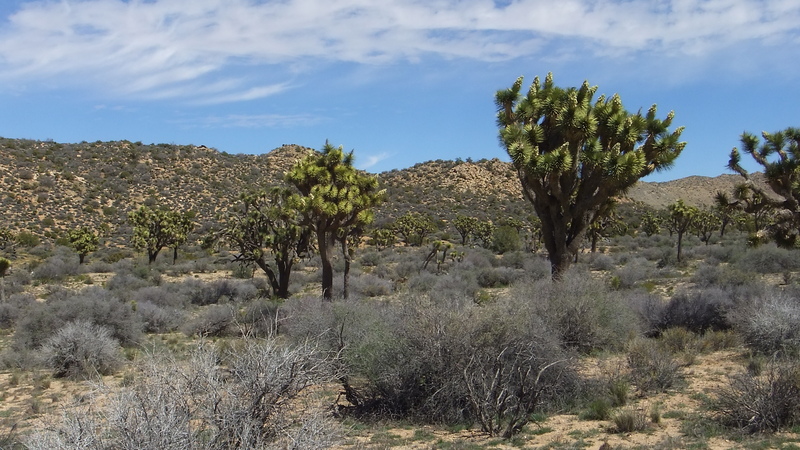 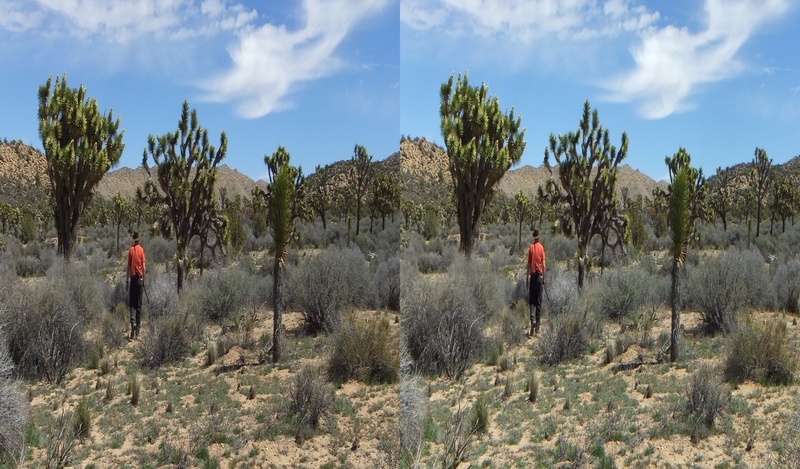 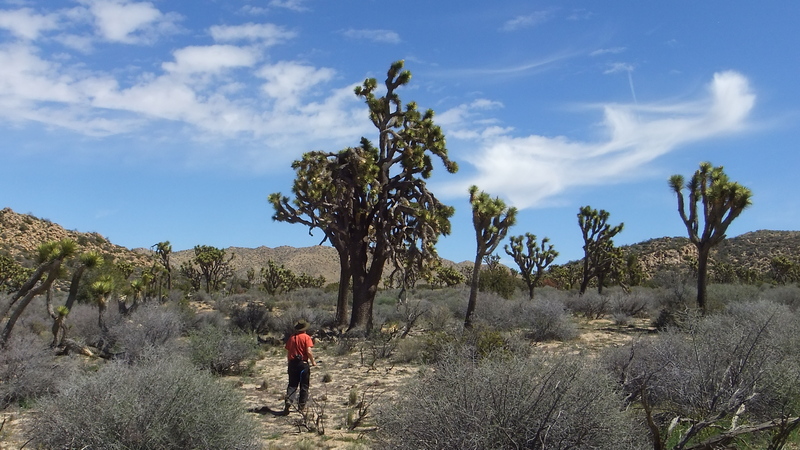 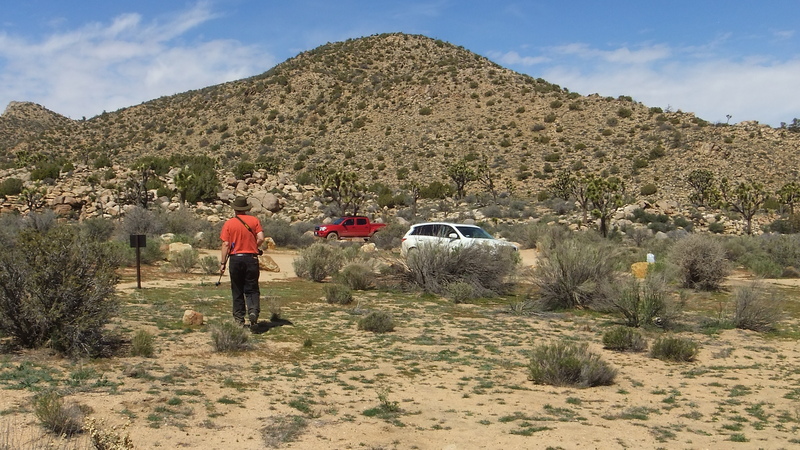 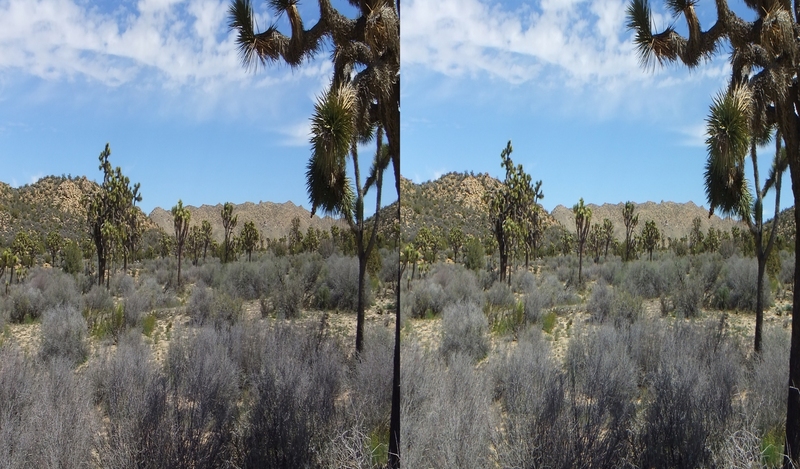 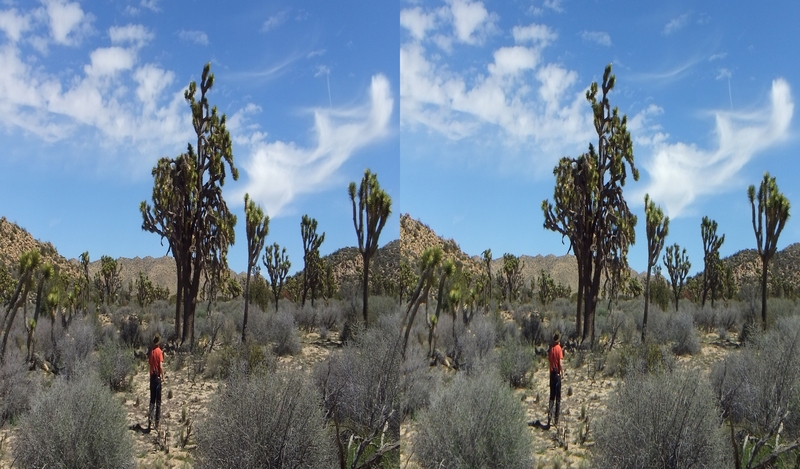 As has been observed in the other Covington Flats and Black Rock Galleries, 2016 was a year that the Joshua trees experienced a superbloom cycle in JTNP (and presumably elsewhere from New Mexico, through the desert Southwest, and into Nevada). 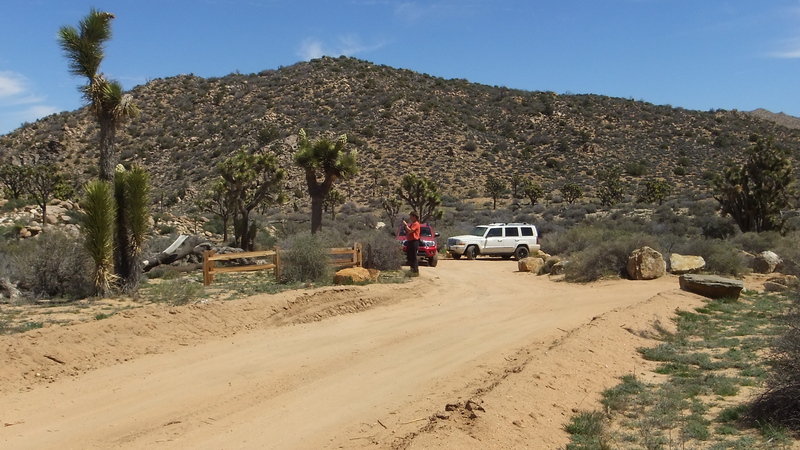 Visitors will want to note that there are no picnic tables or restroom facilities at the Upper Covington loop parking area and Backcountry Board. 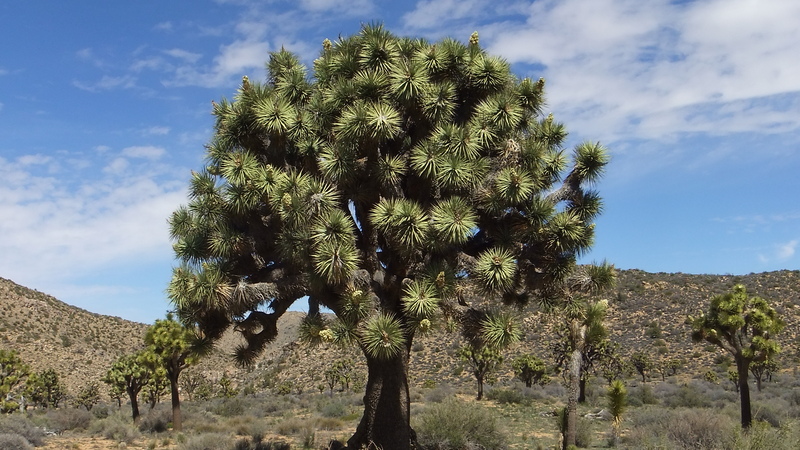 However, close by is one very decent-sized shade tree (the tall mature tree, second in the block of four above with picnickers beneath it; and also the first of the five shown below) where you can toss down your picnic-mat or blanket to enjoy a leisurely meal. 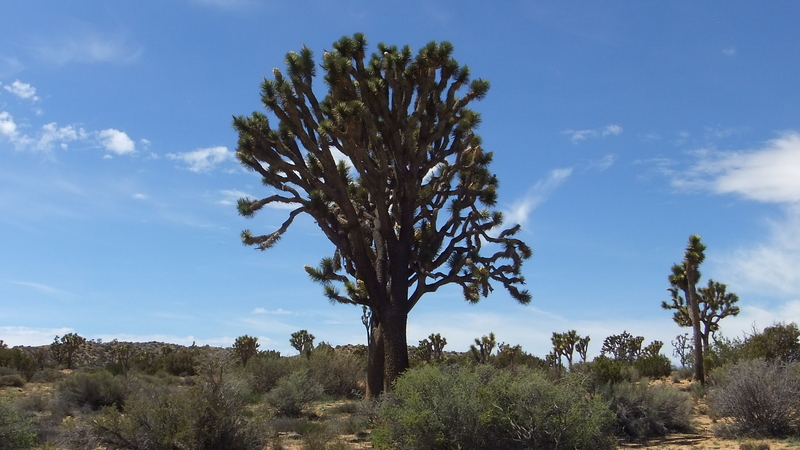 This particular specimen was hosting dozens of blossoms when we visited the area. 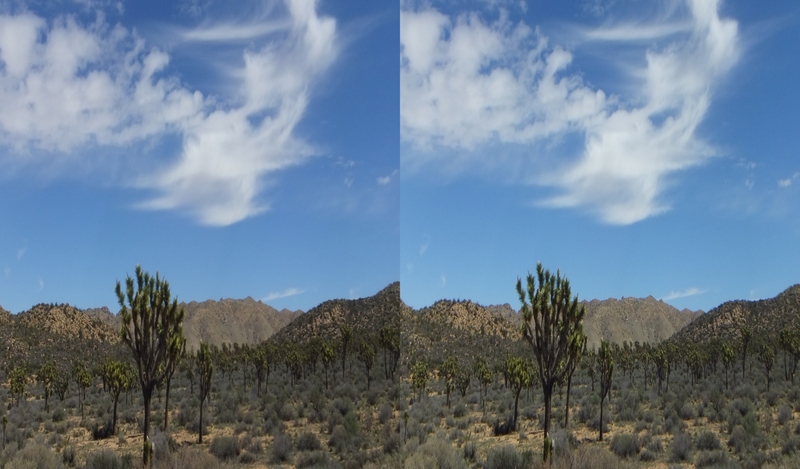 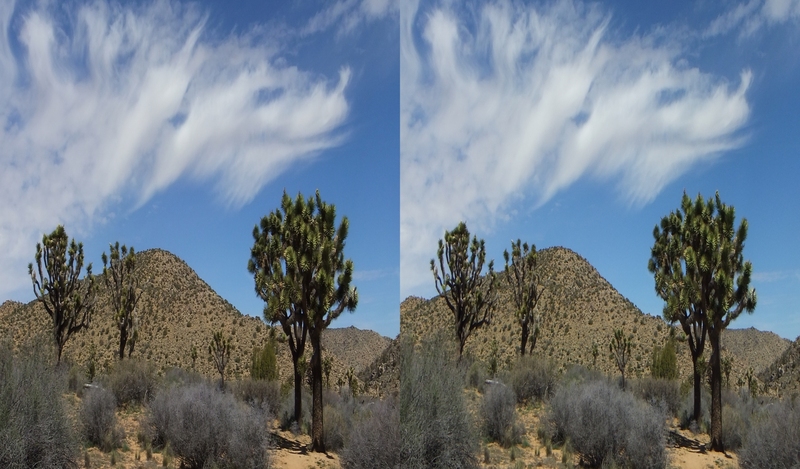 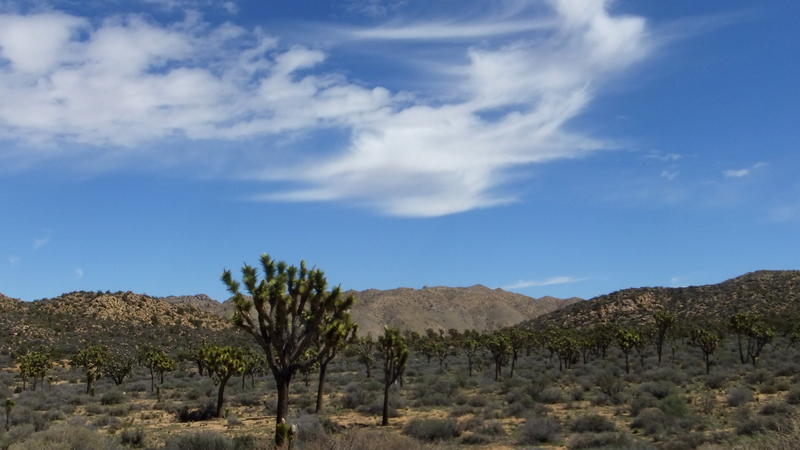 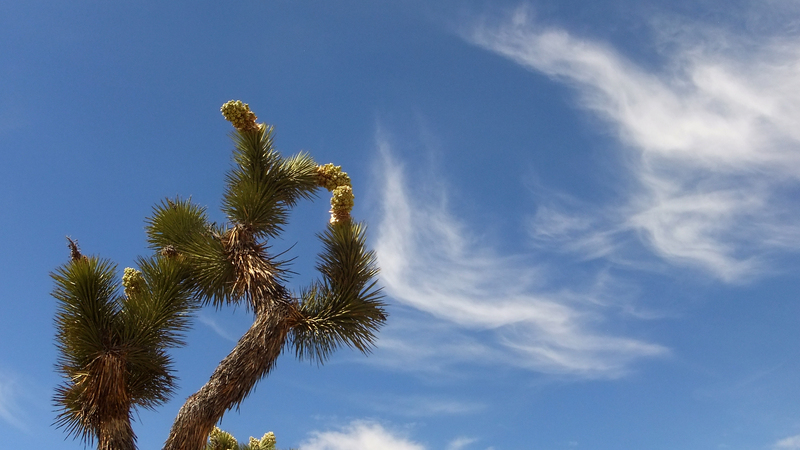 Additional examples of the superbloom trees and the beautiful cloud formations at Upper Covington Flat, not on this page, are available in the Joshua Tree Superbloom 2016 Gallery and the Upper Covington Flat Clouds page. 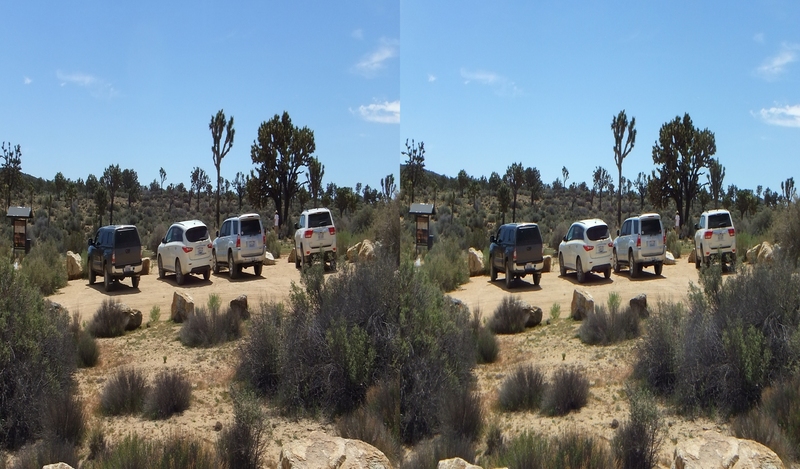 There were simply too many for a single Gallery. 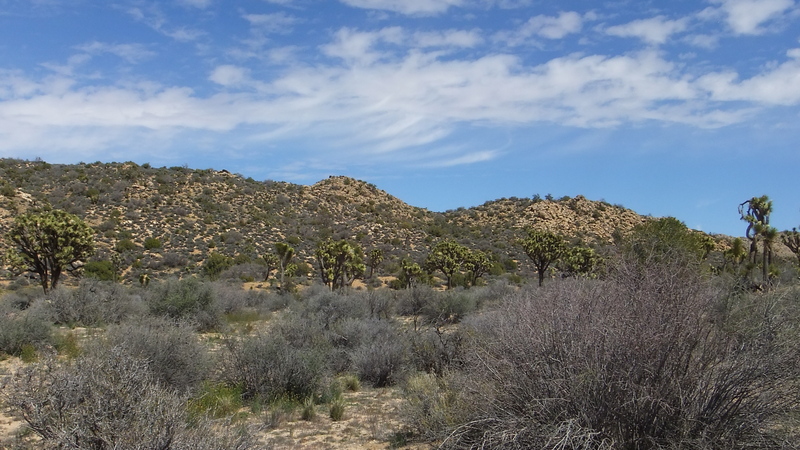 The Upper and Lower flats receive thorough coverage in my friend Elliot Koeppel’s article HERE. 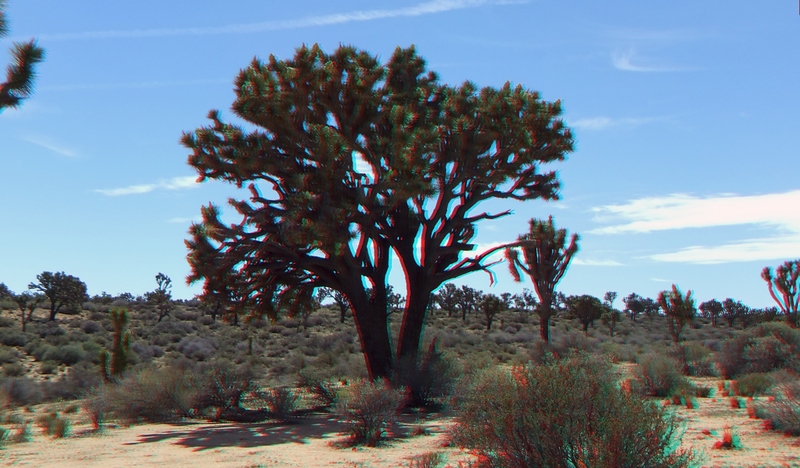 E! 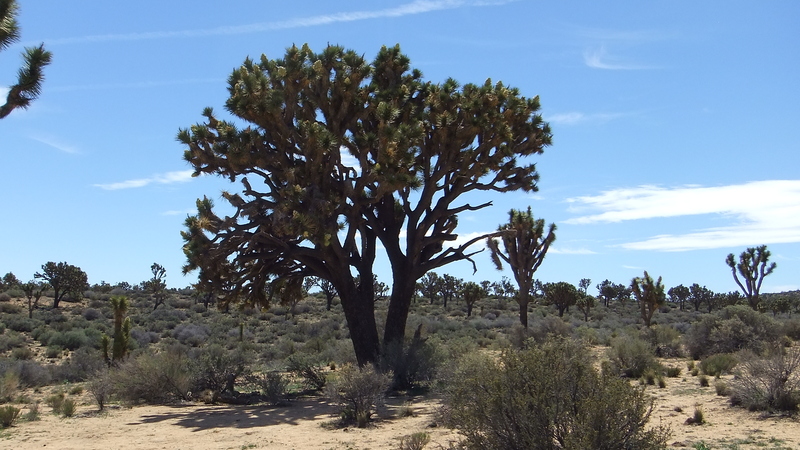 and I, while we did not traverse the entire valley at Upper Covington, we did encounter many of the aforementioned pockets of thick vegetation—and mighty fine looking tall old trees, many of them stately appearing. 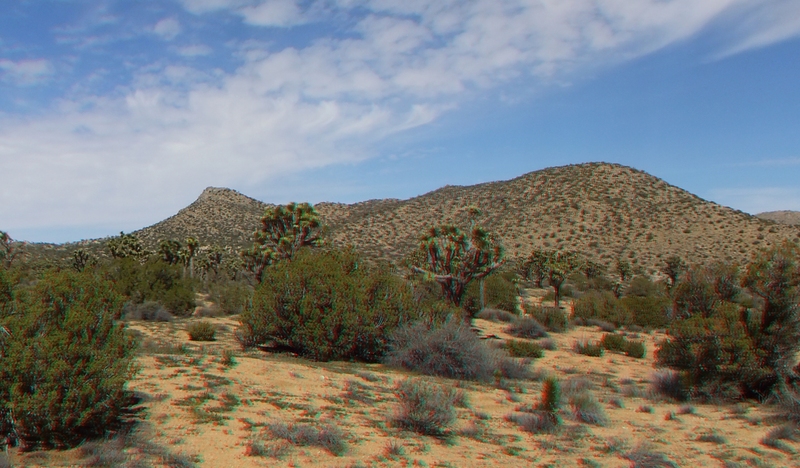 They dominate the desert floor. 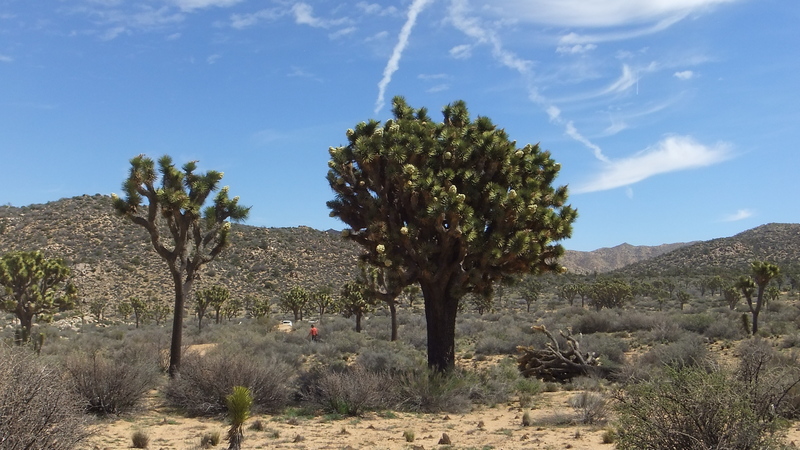 The taller ones stand out from the forest at a distance. 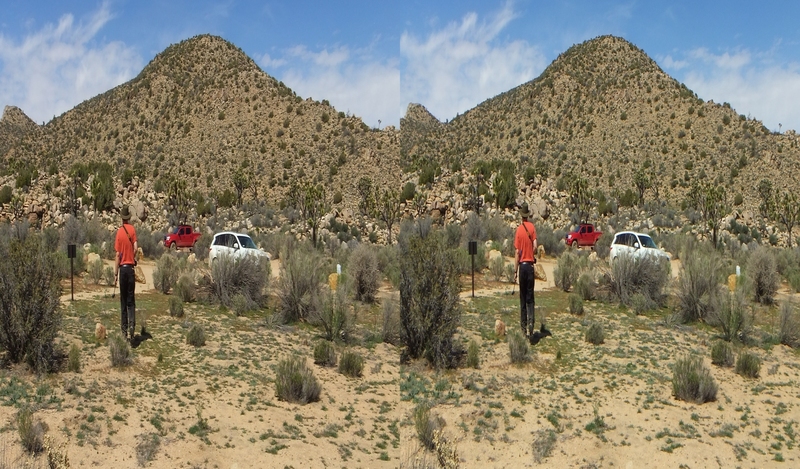 We wanted to visit every one! 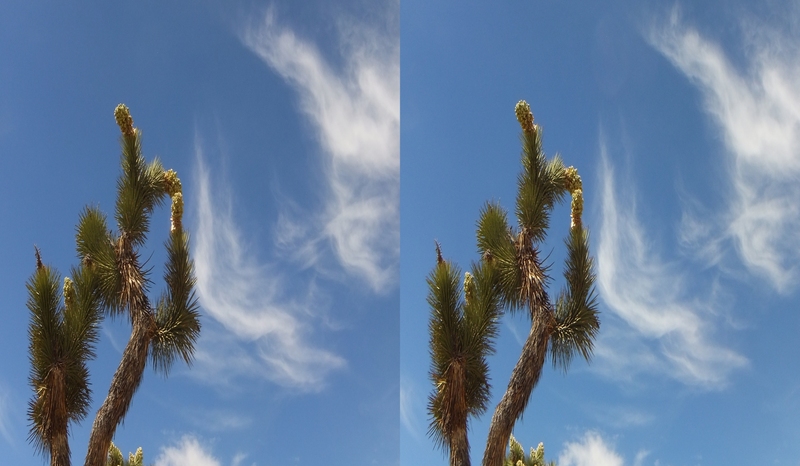 Many Joshua Trees and Mojave yuccas were also displaying beautiful early Spring flower stalks. 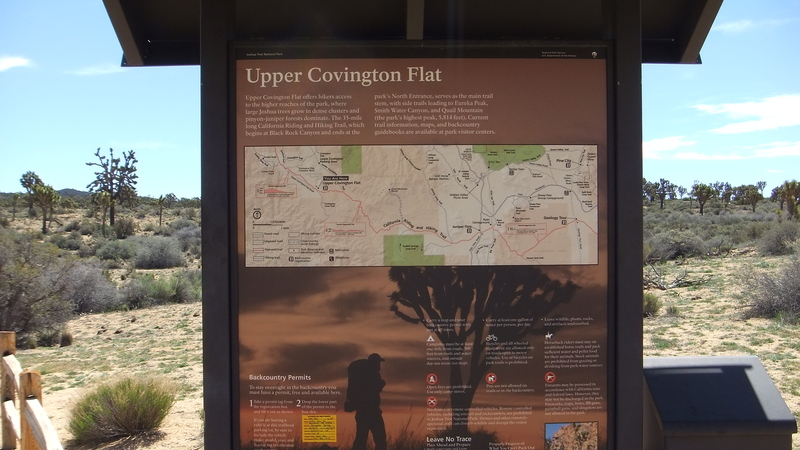 Upper Covington is connected to Lower Covington by a 5.7 mile ‘loop’ hiking trail as well as by a winding dirt road up over a 5200ft elevation ridge to the picnic area and parking circle in Lower Covington. 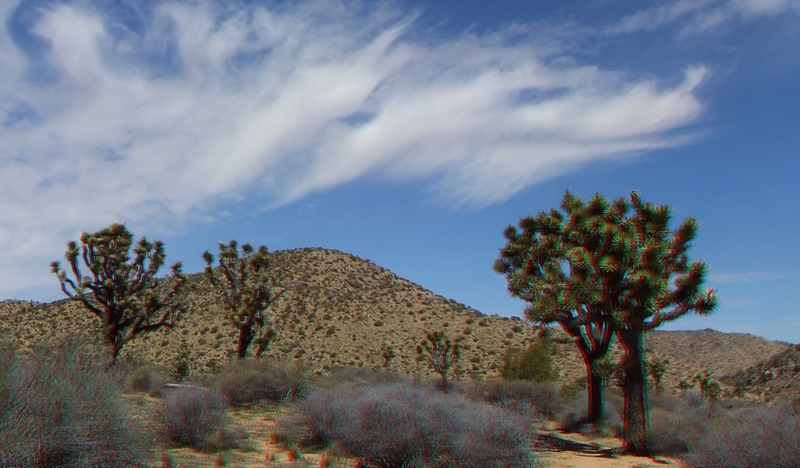 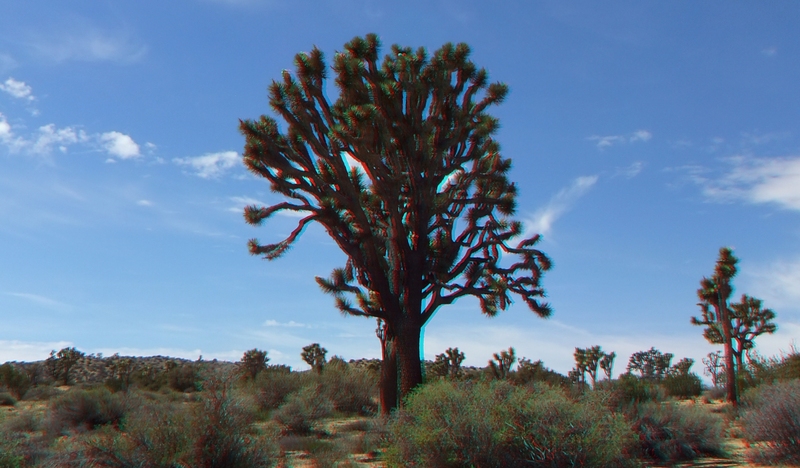 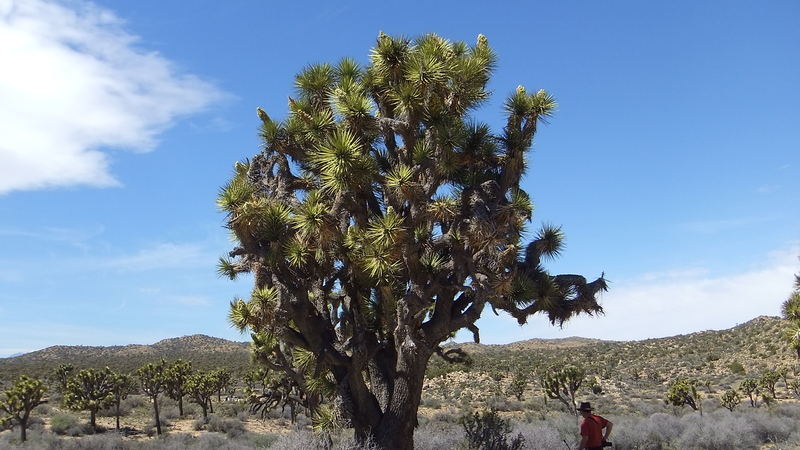 Photographs from Patty Furbush’s Joshua Tree hiking guide, and two that E! 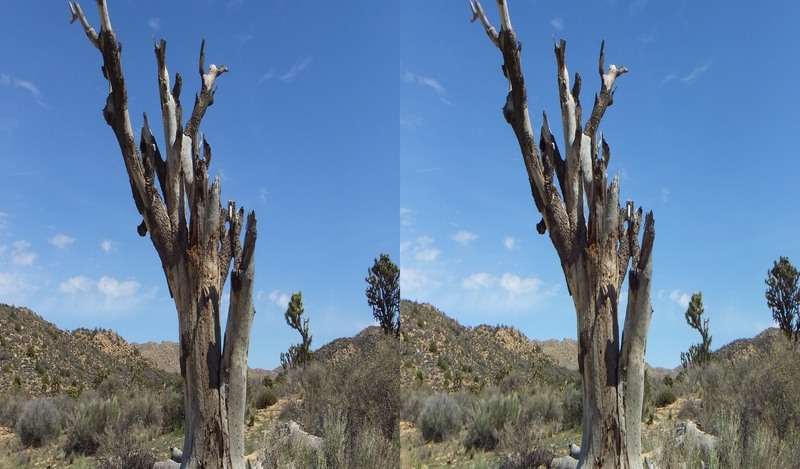 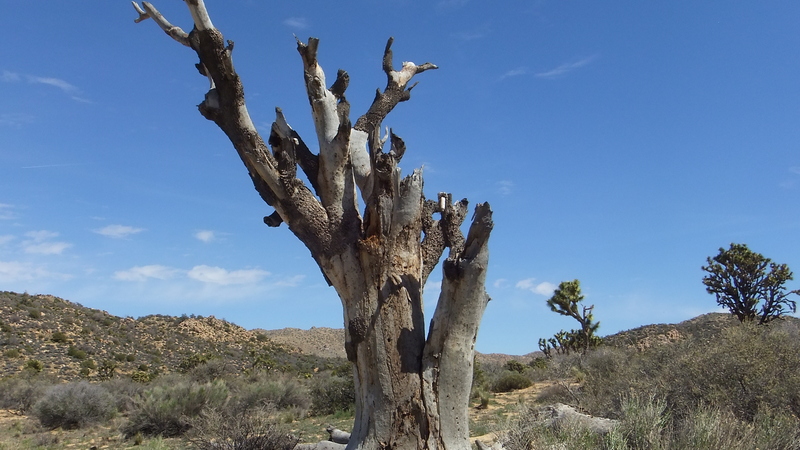 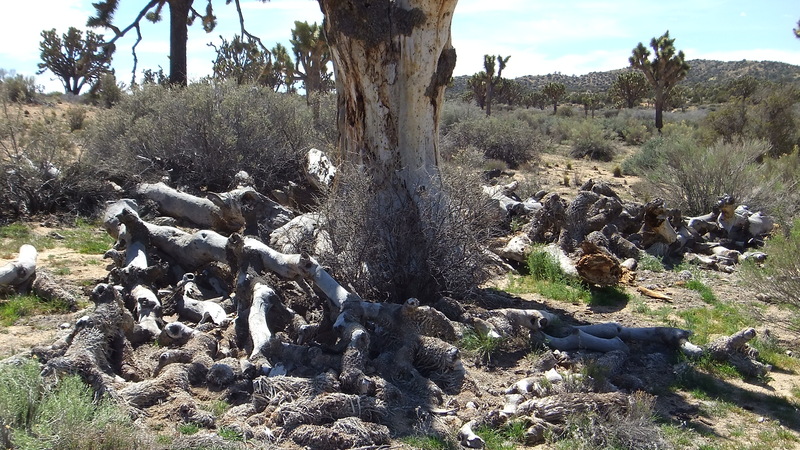 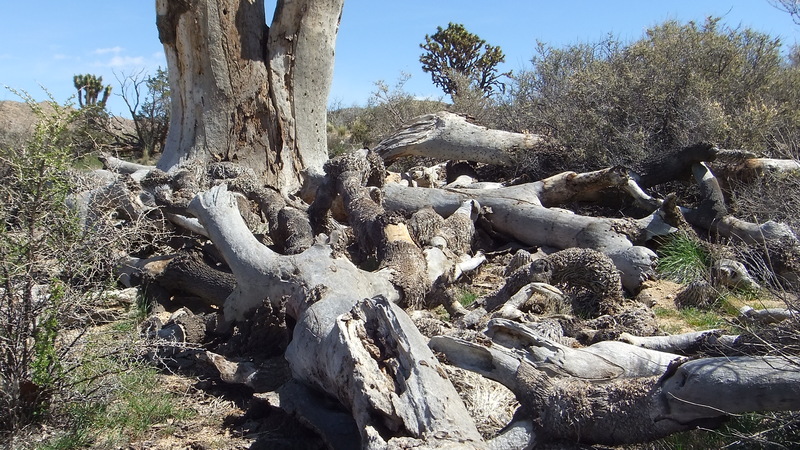 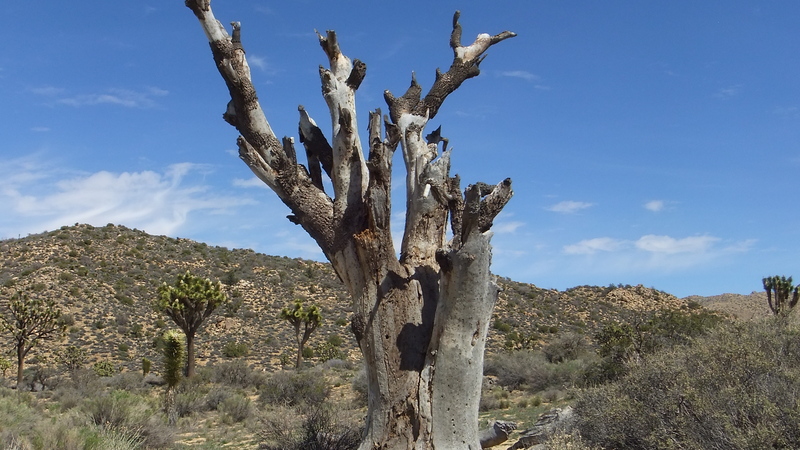 shows on his Covington Flats web page, suggest that this skeleton is all that remains of what was once said to be the tallest Joshua Tree in JTNP. 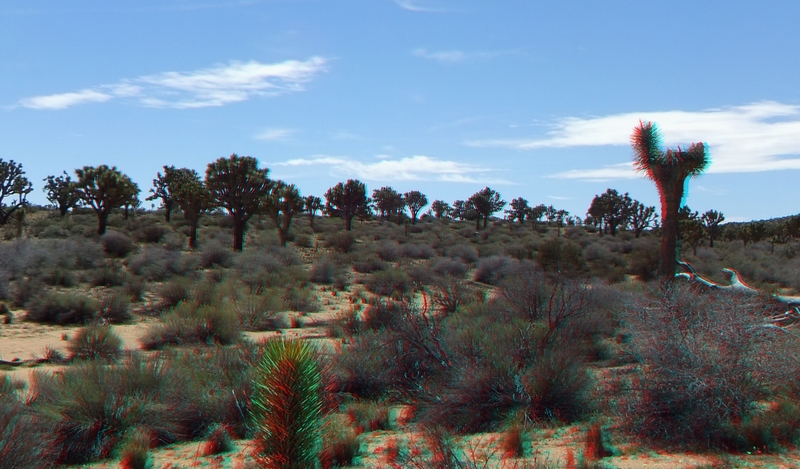 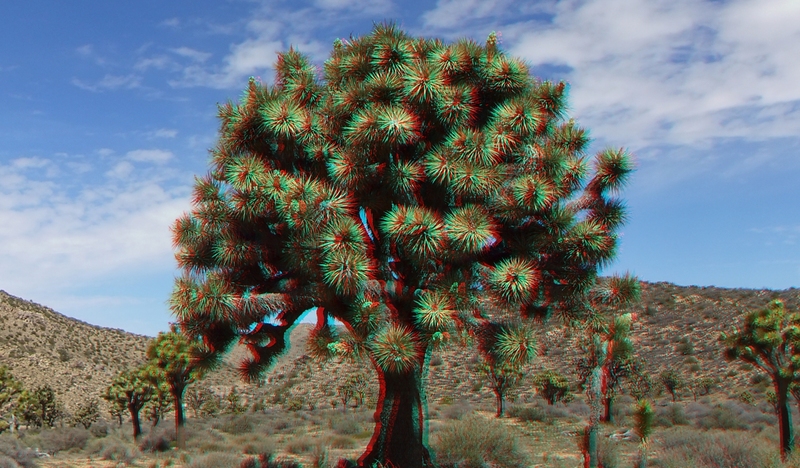 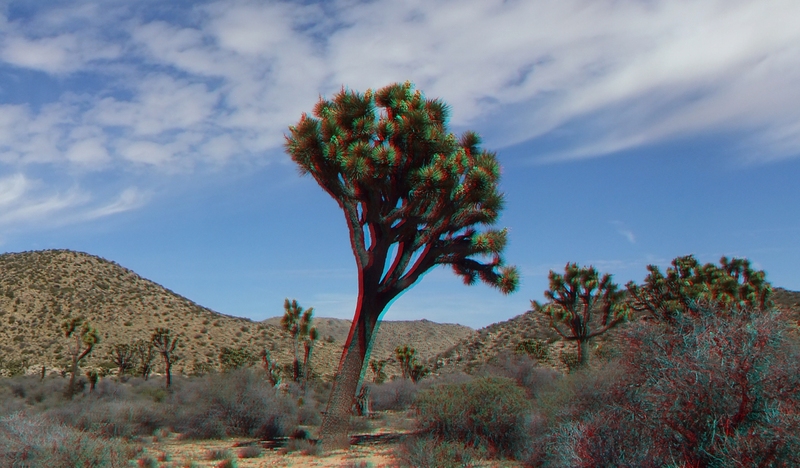 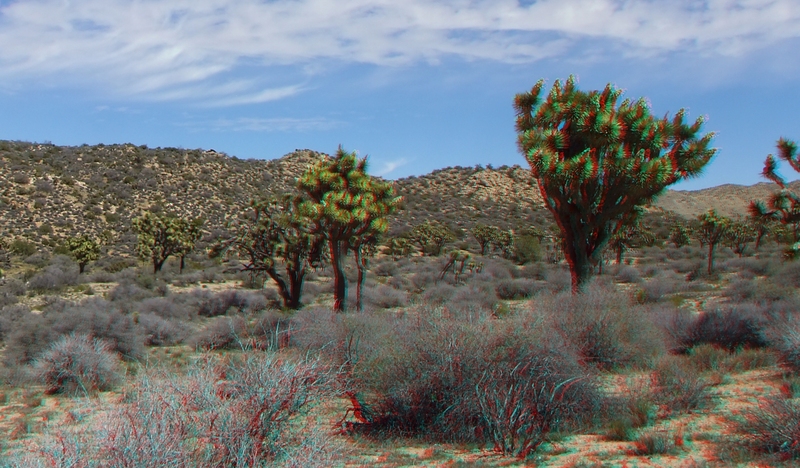 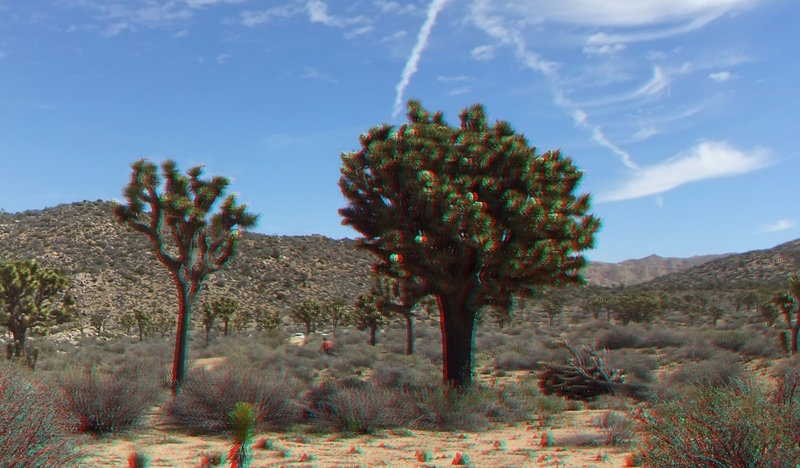 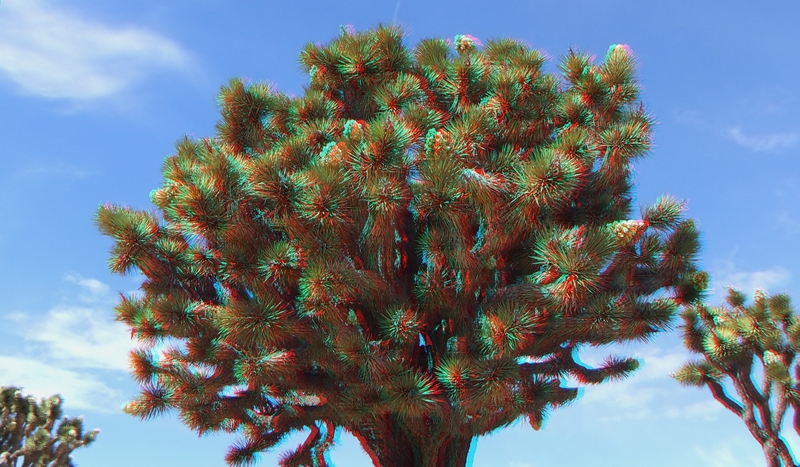 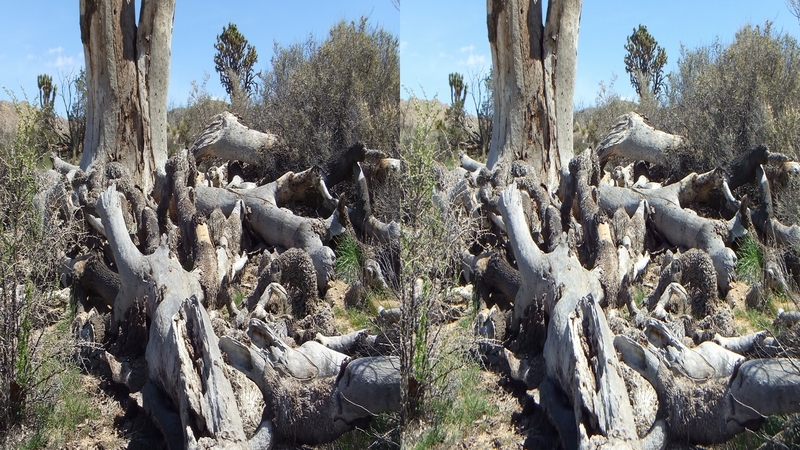 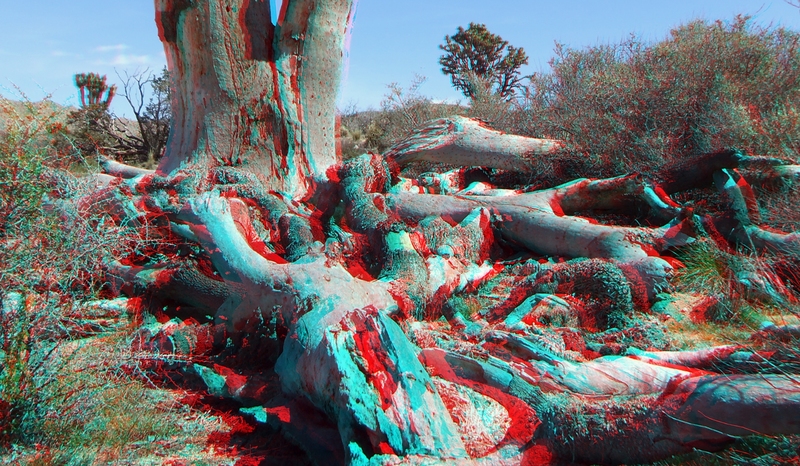 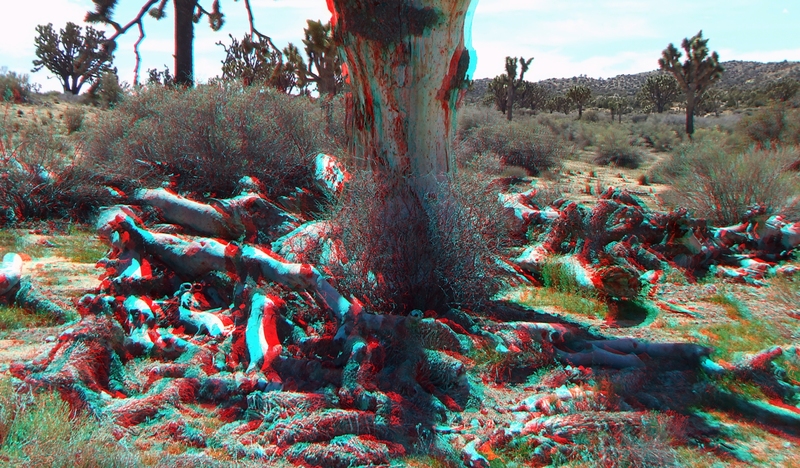 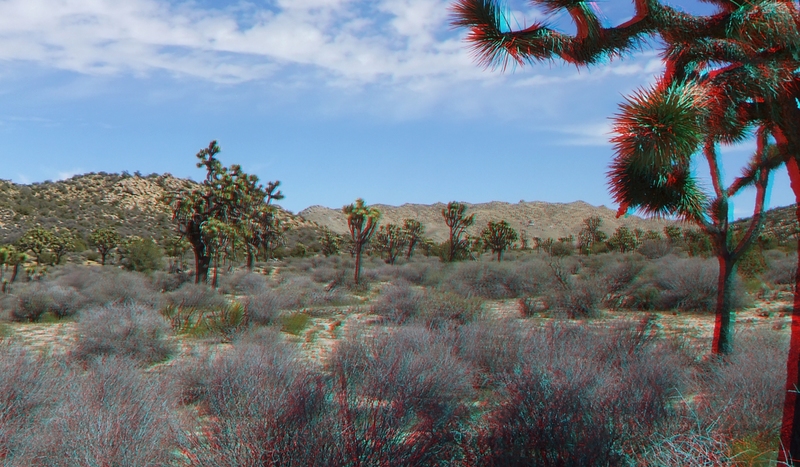 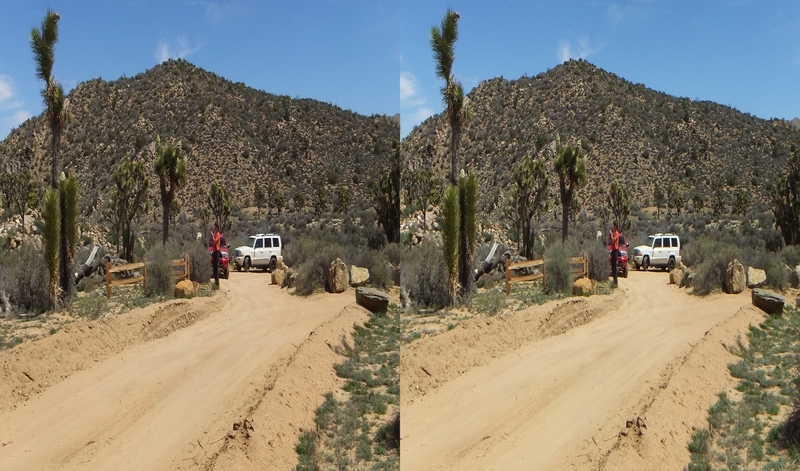 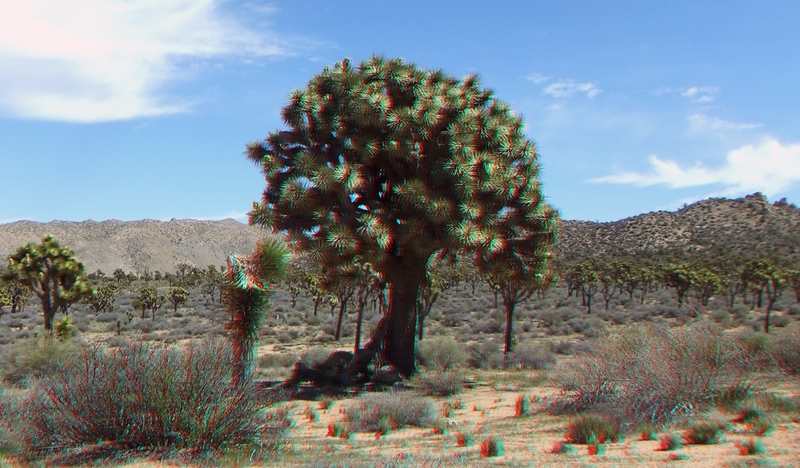 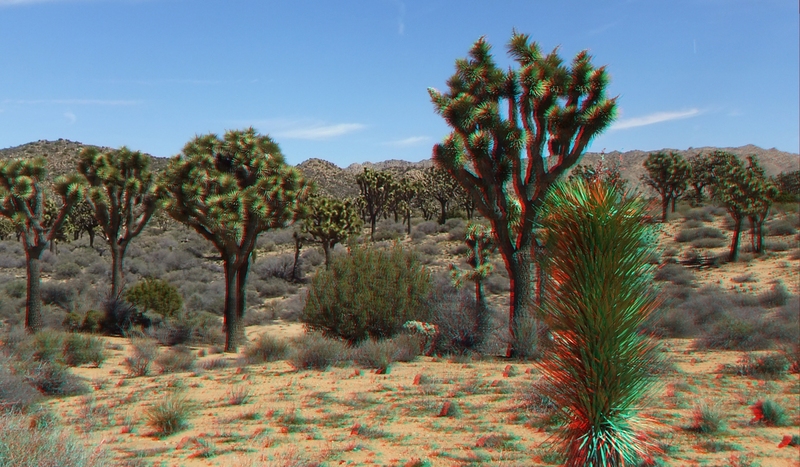 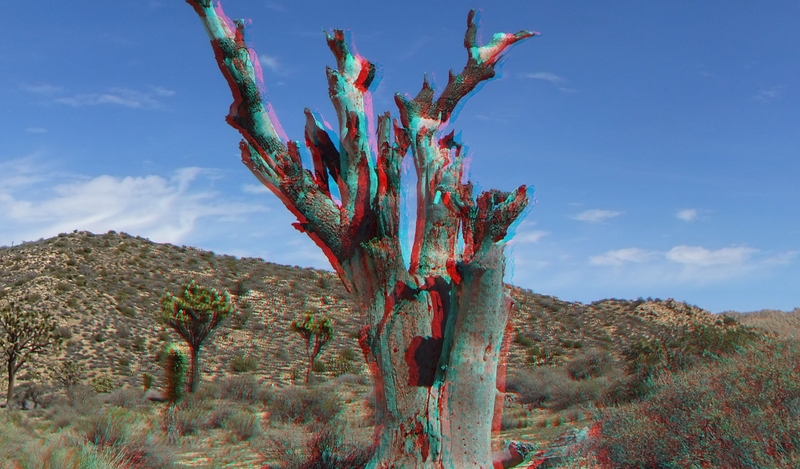 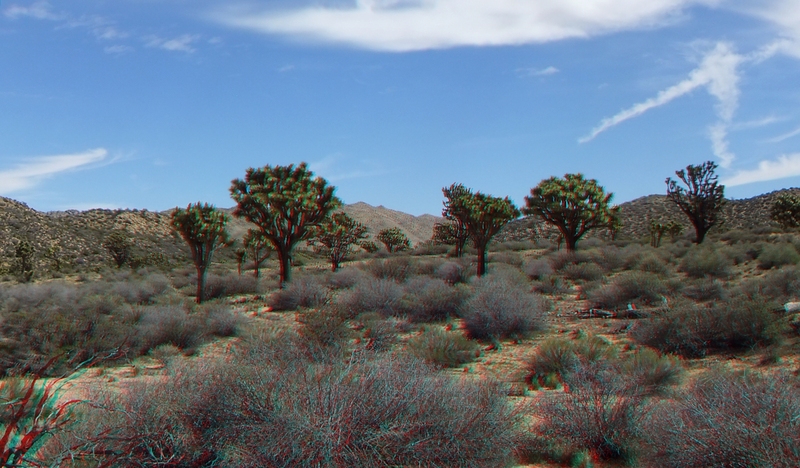 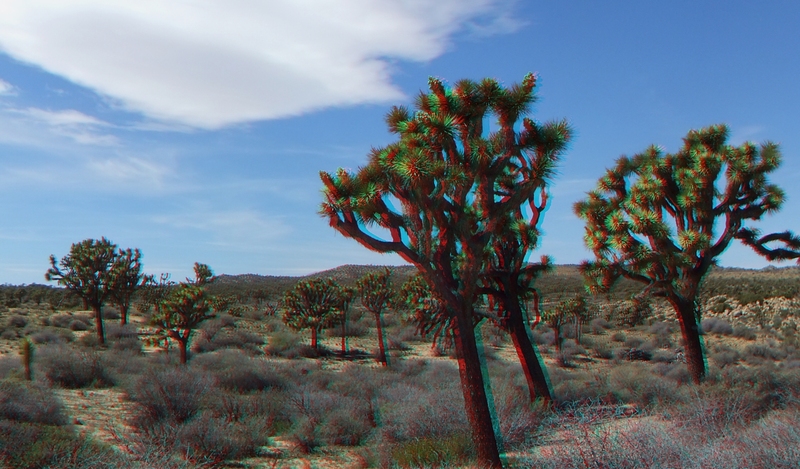 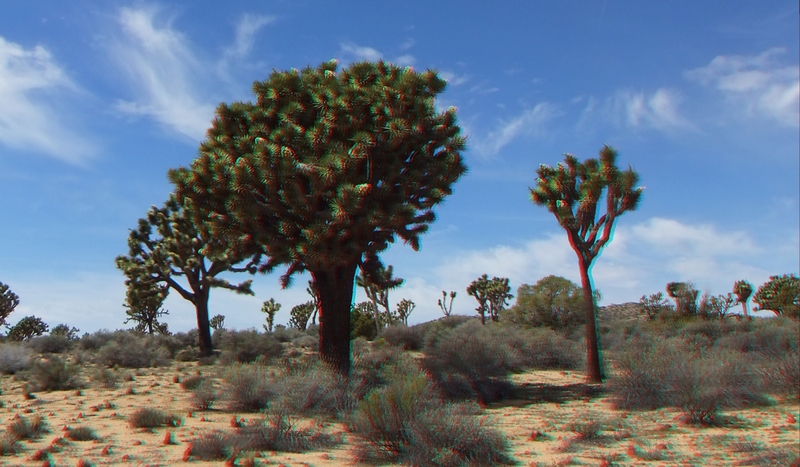 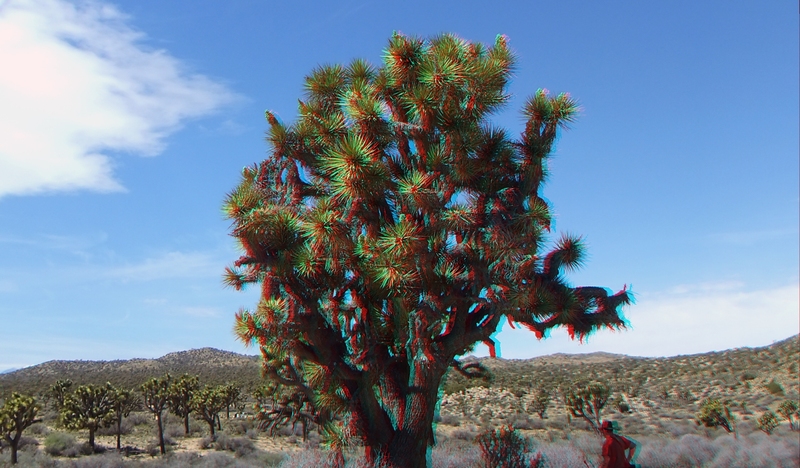 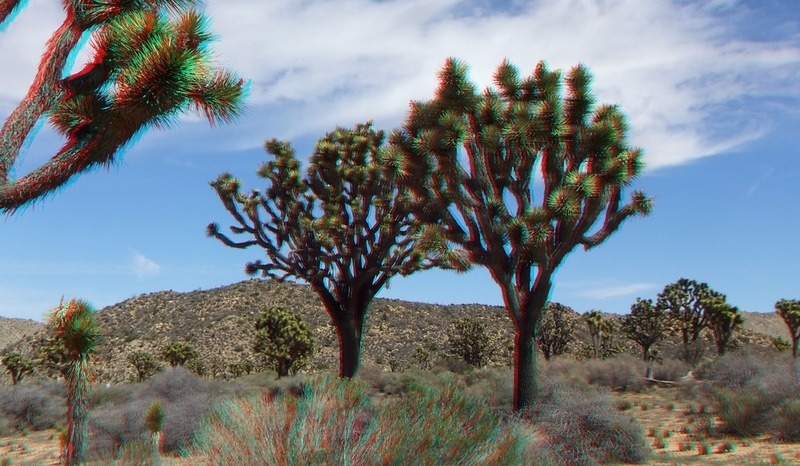 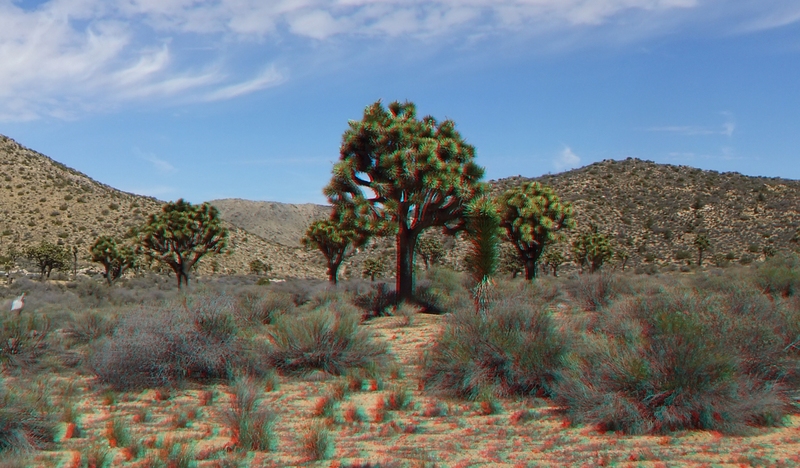 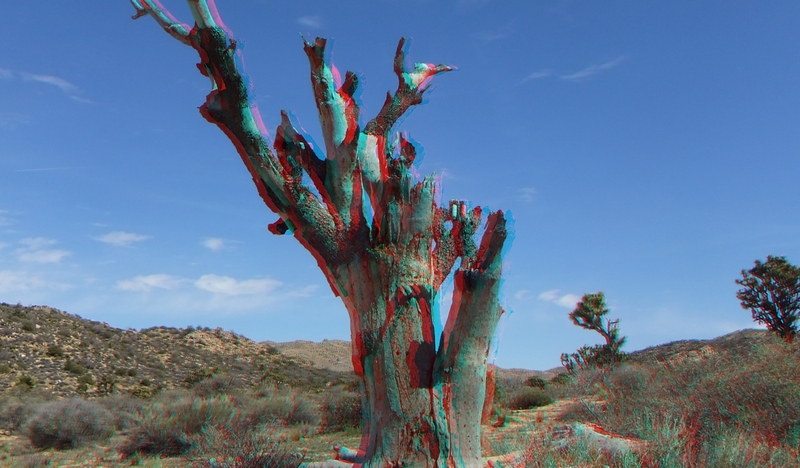 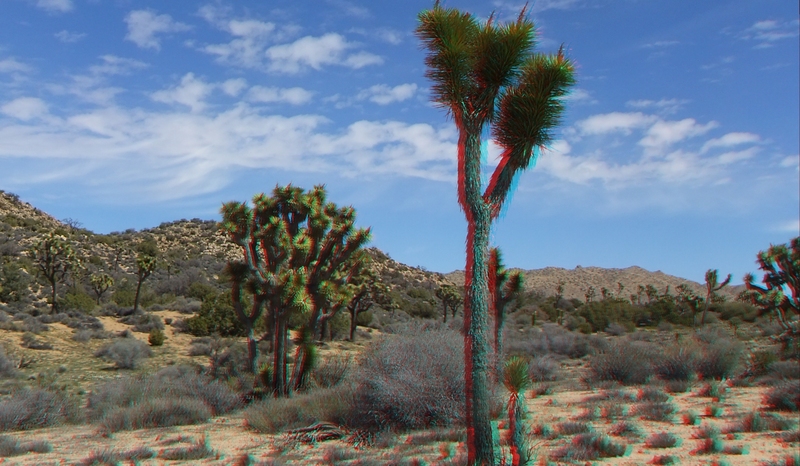 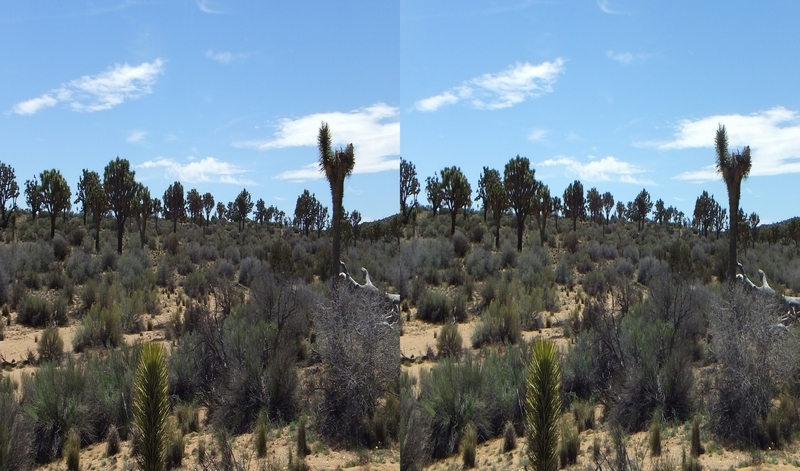 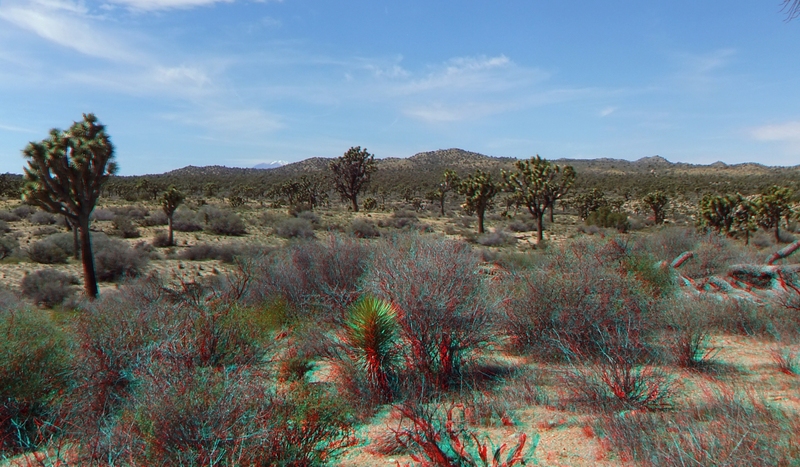 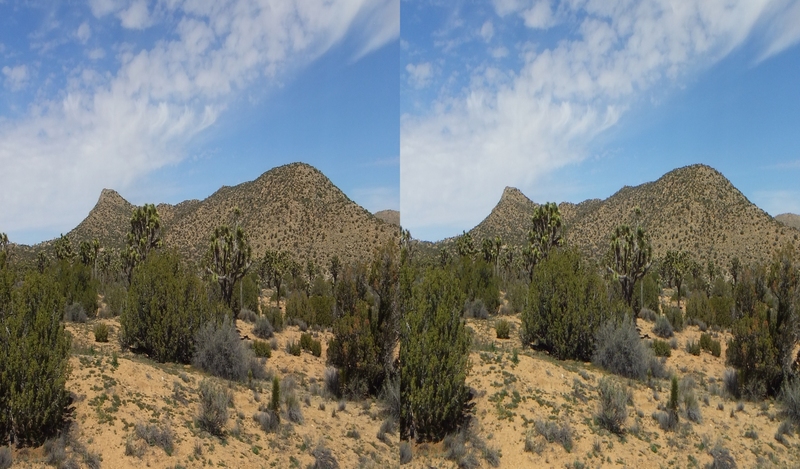 Captured in 3D for possibly the first and last time—see Anaglyph Gallery below—we bid it a fond farewell! 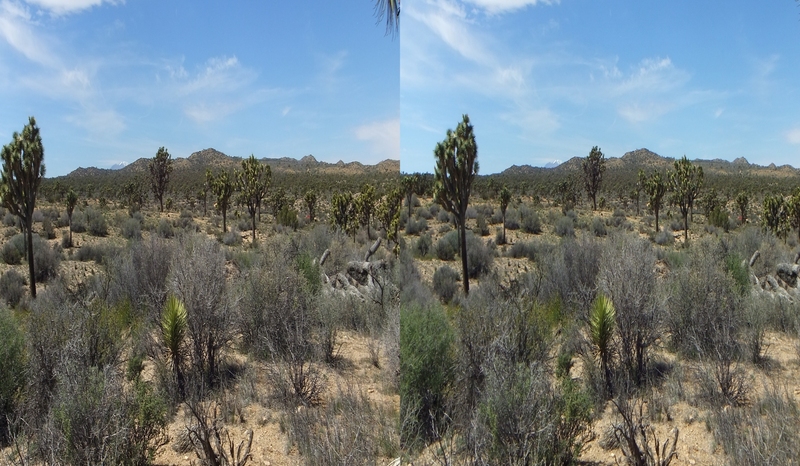 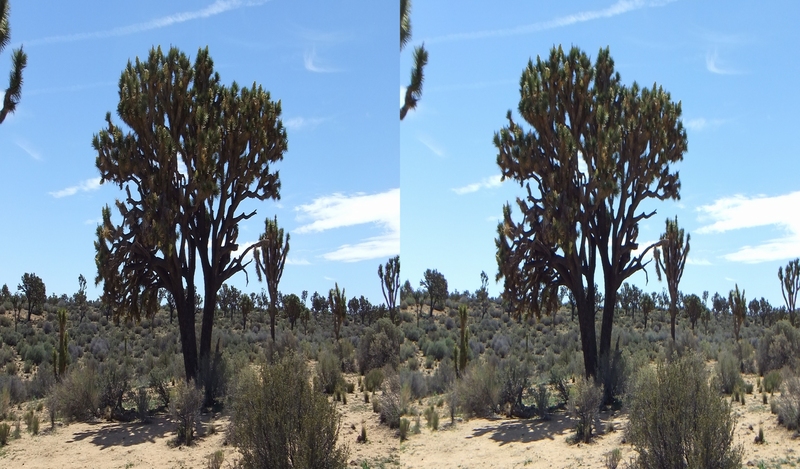 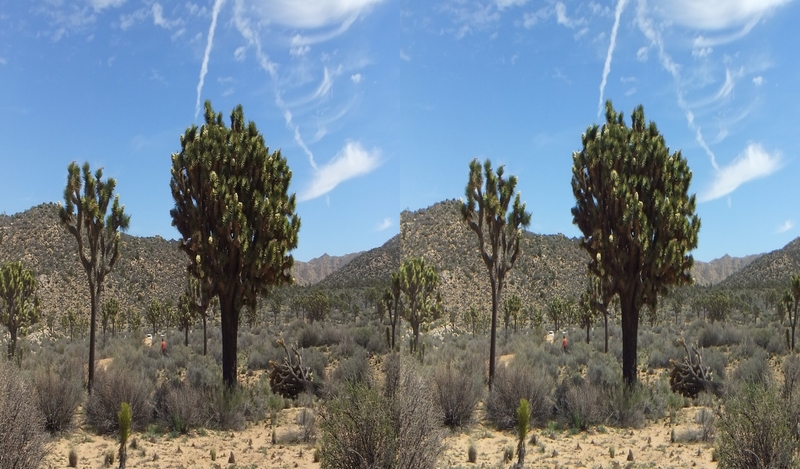 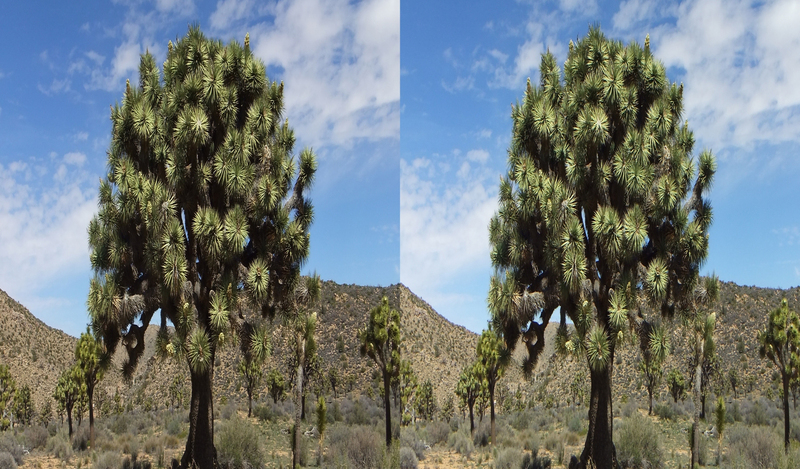 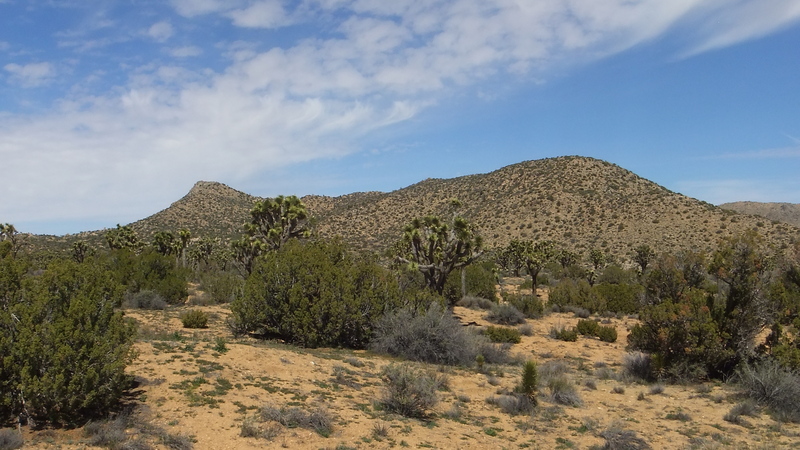 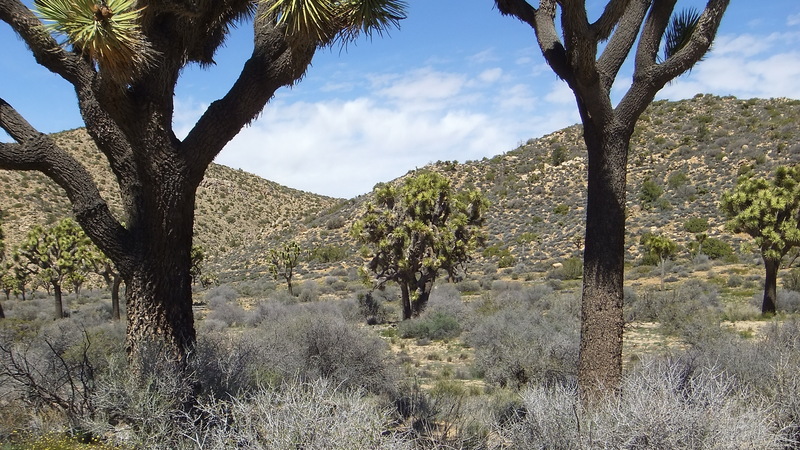 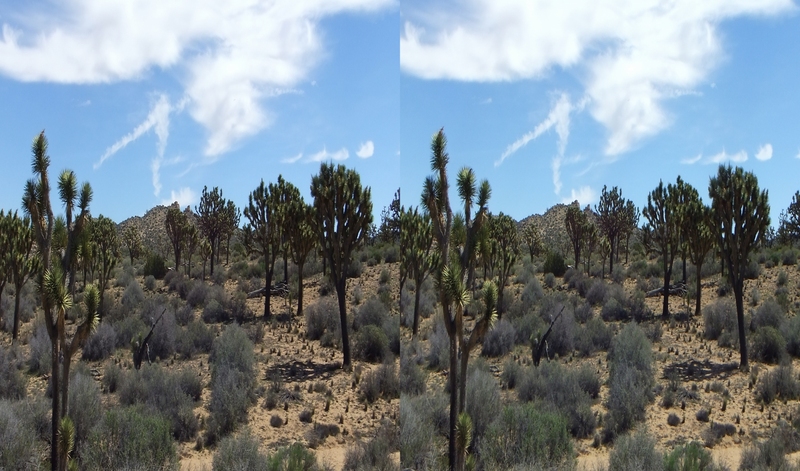 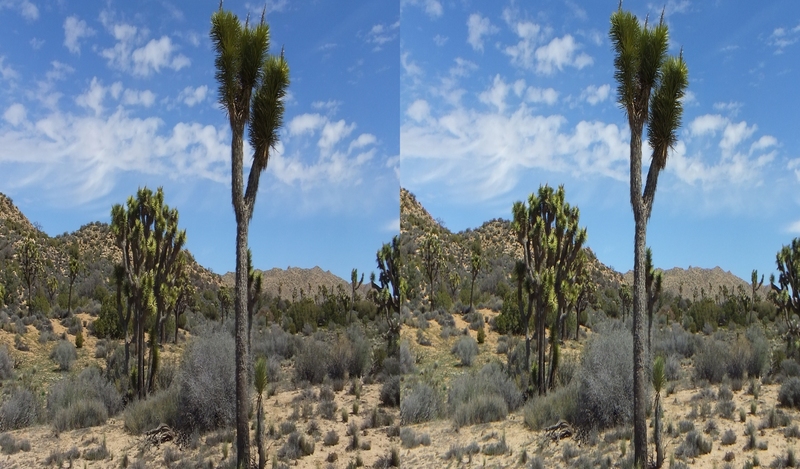 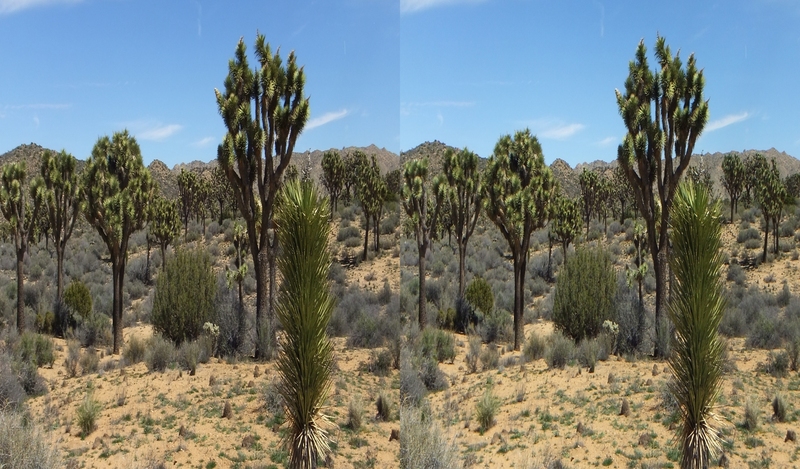 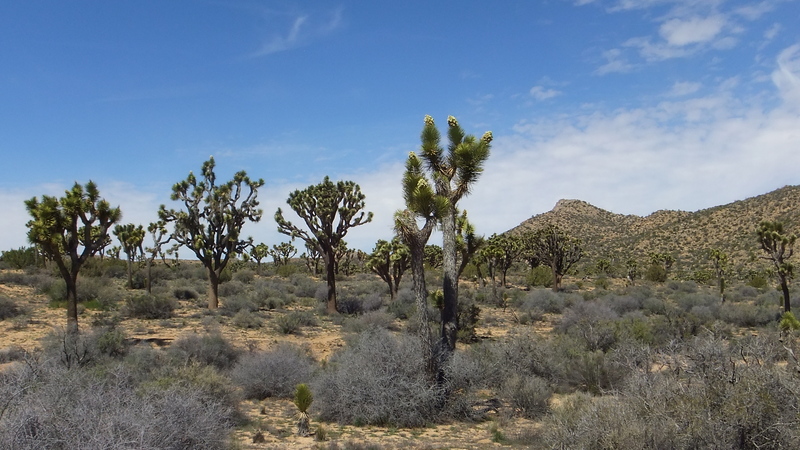 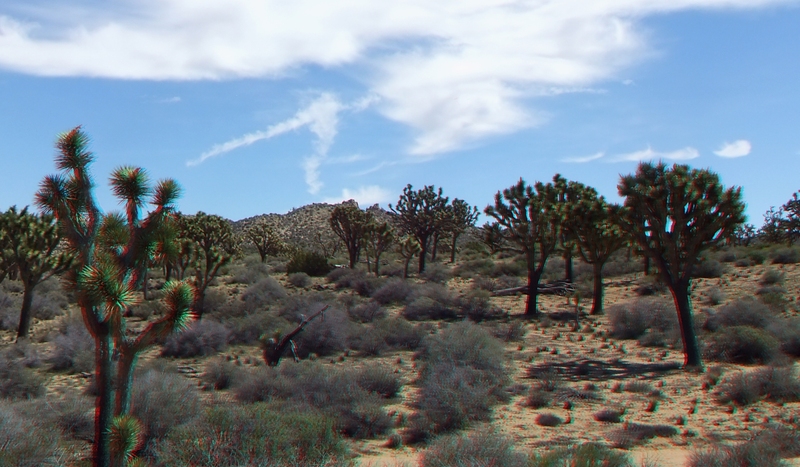 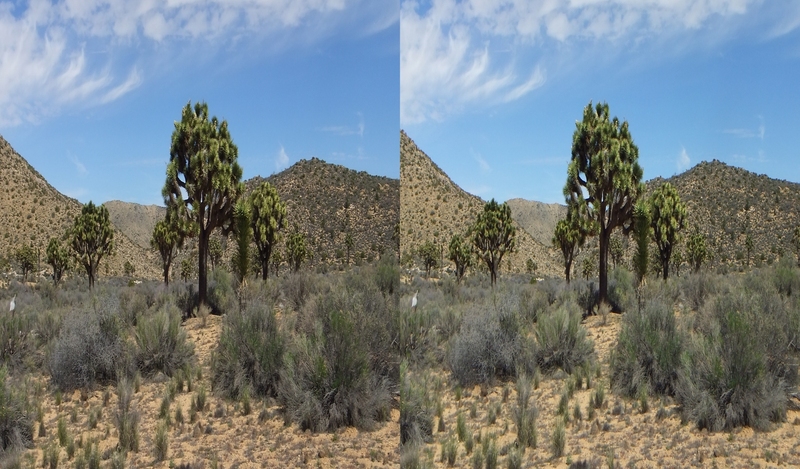 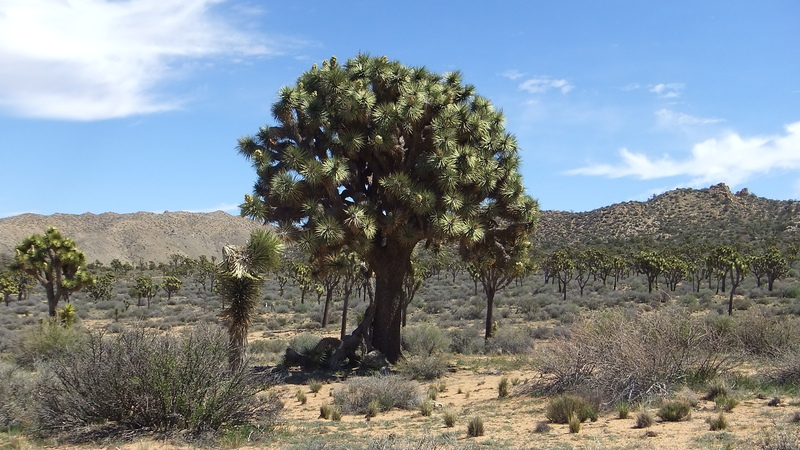 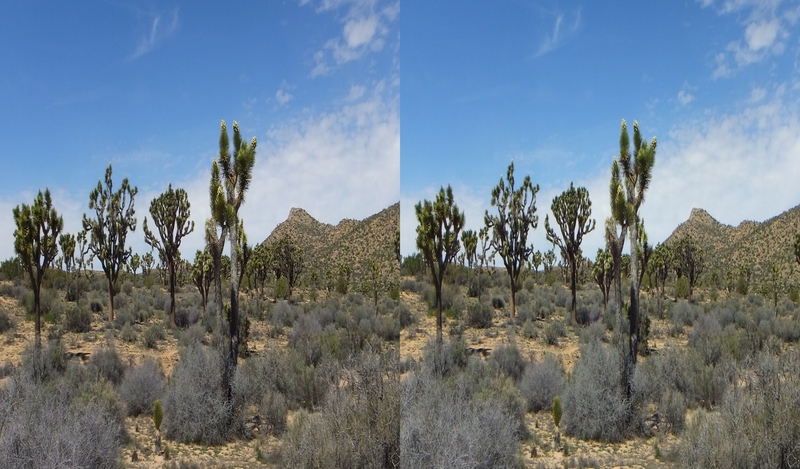 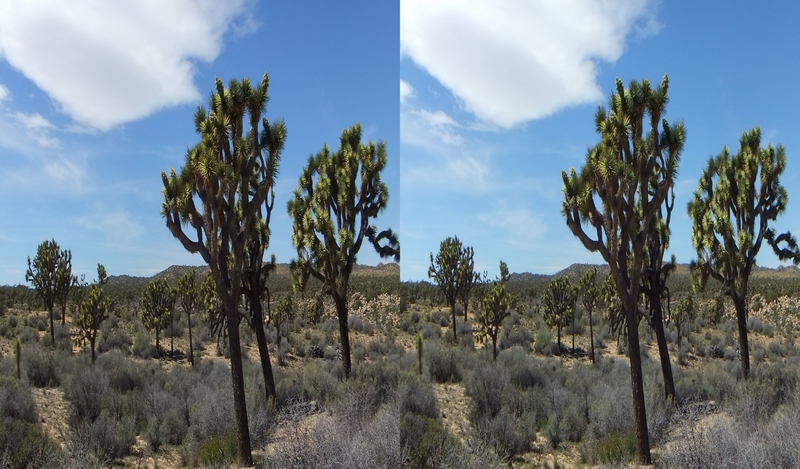 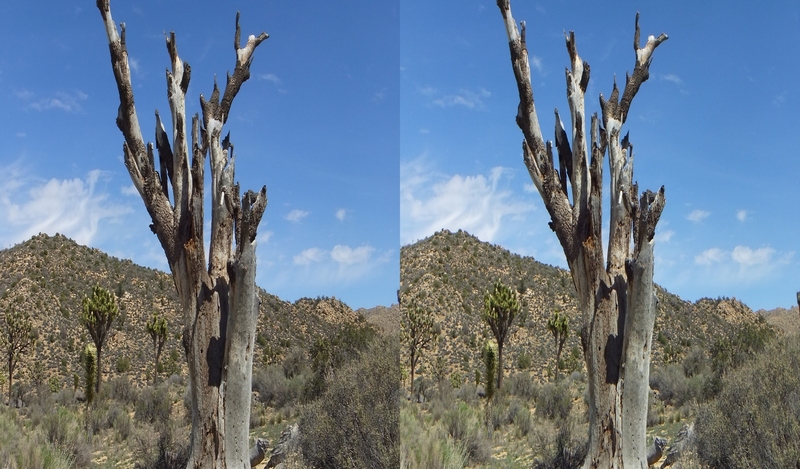 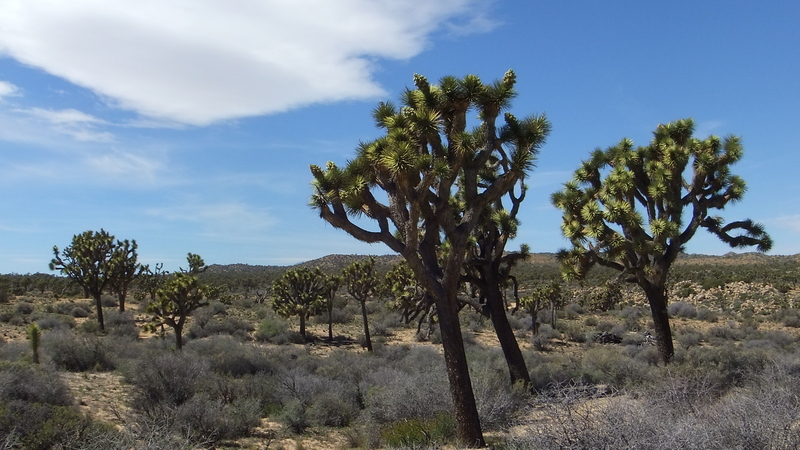 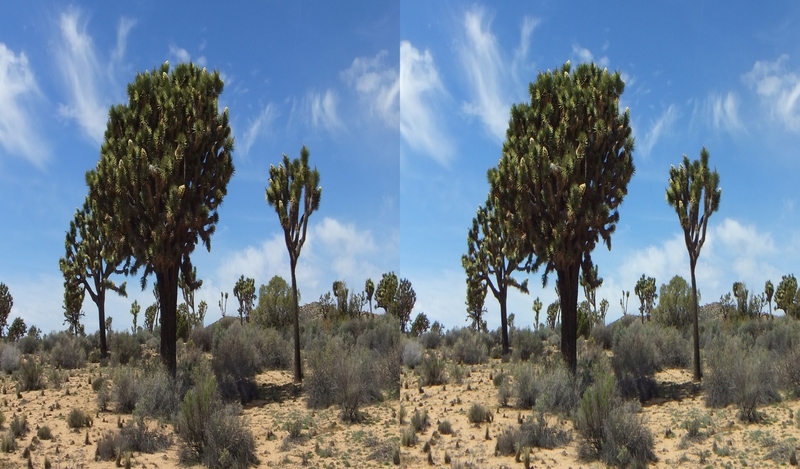 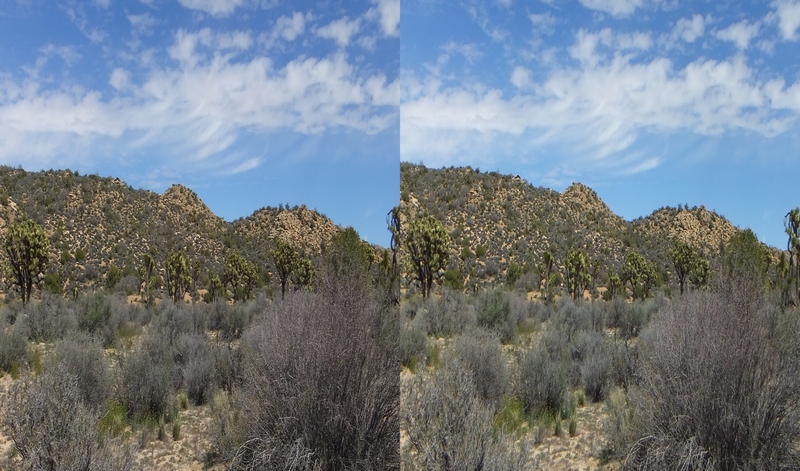 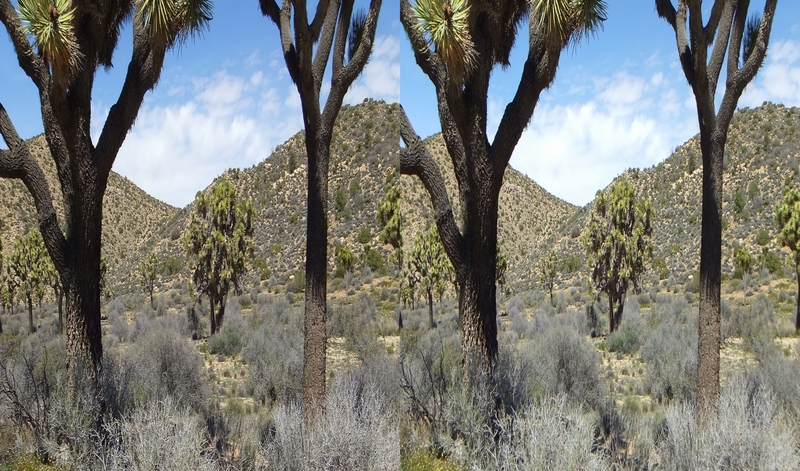 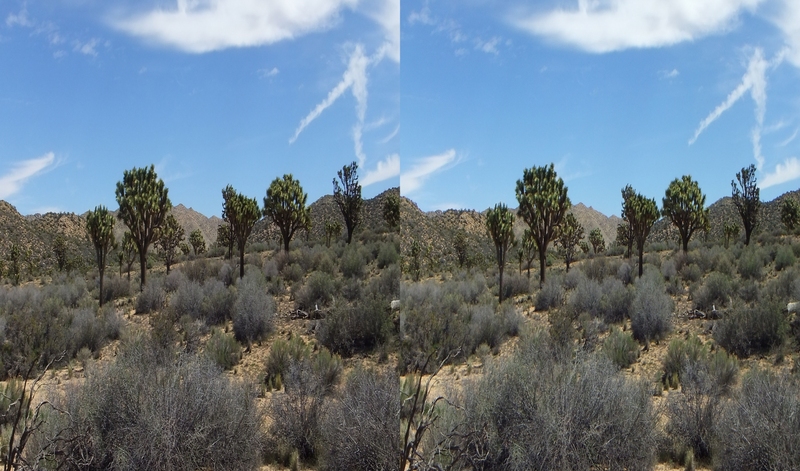 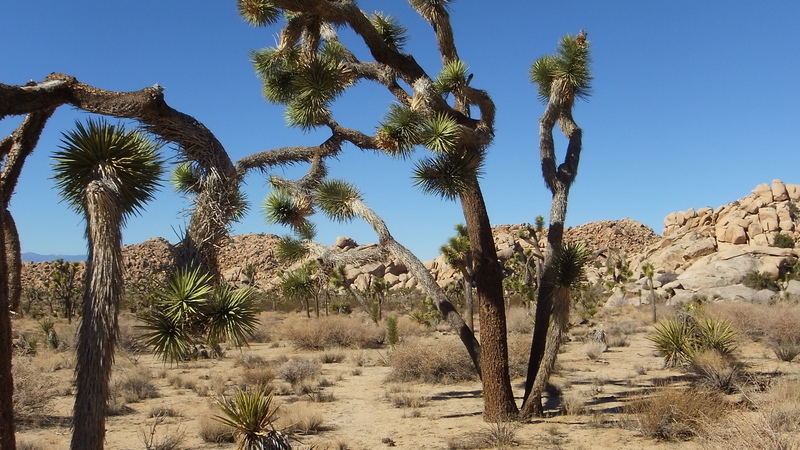 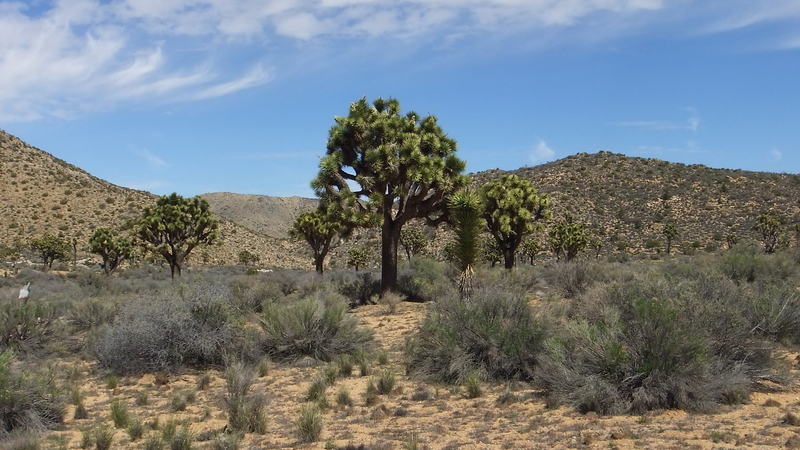 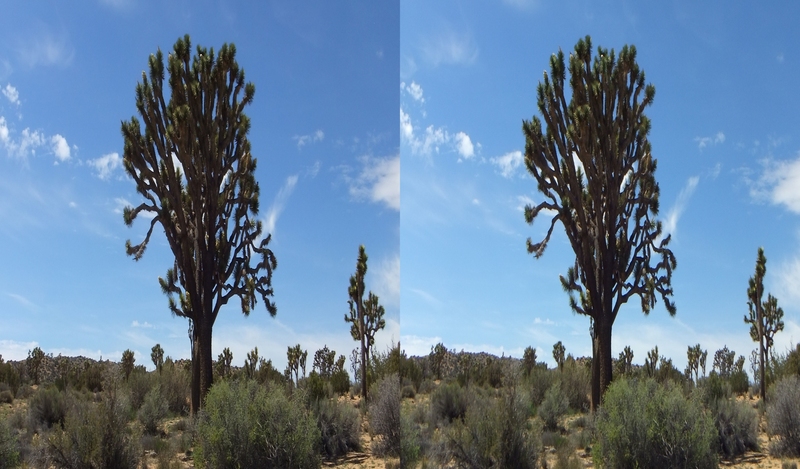 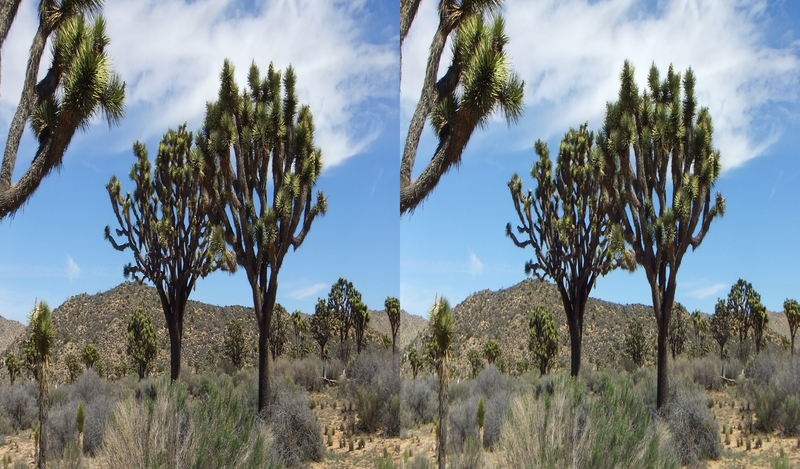 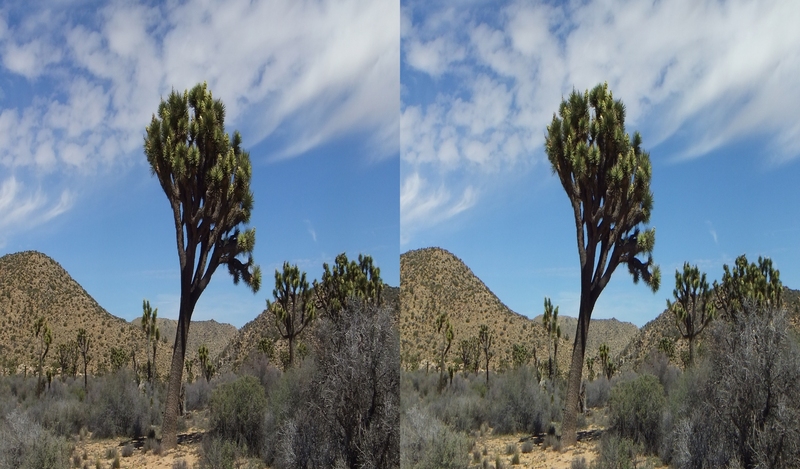 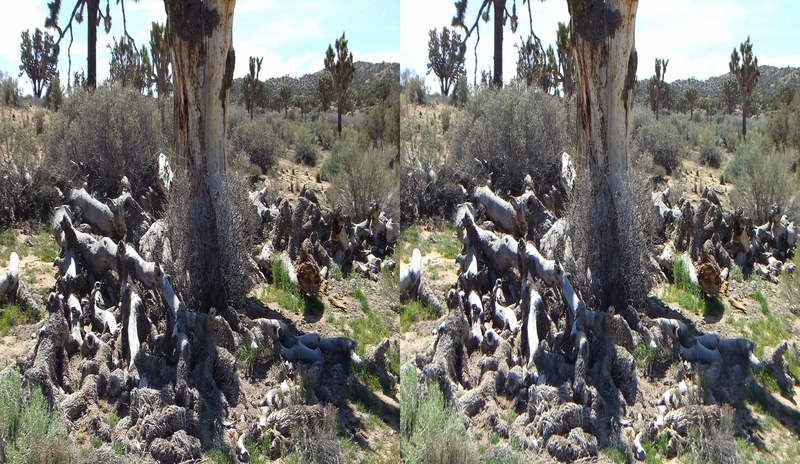 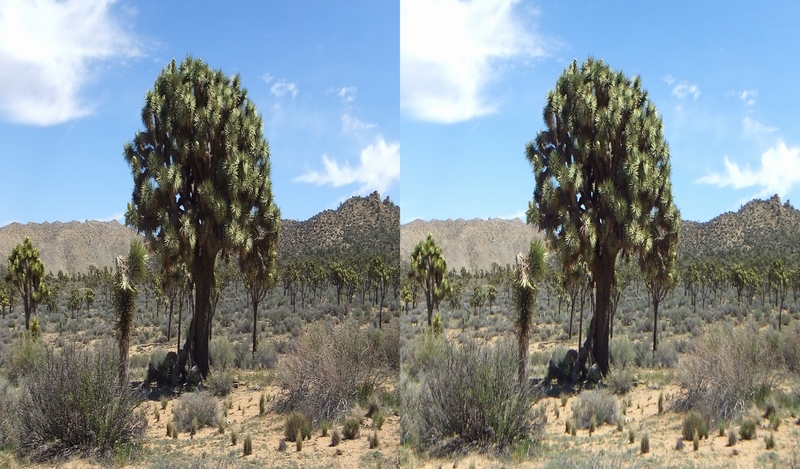 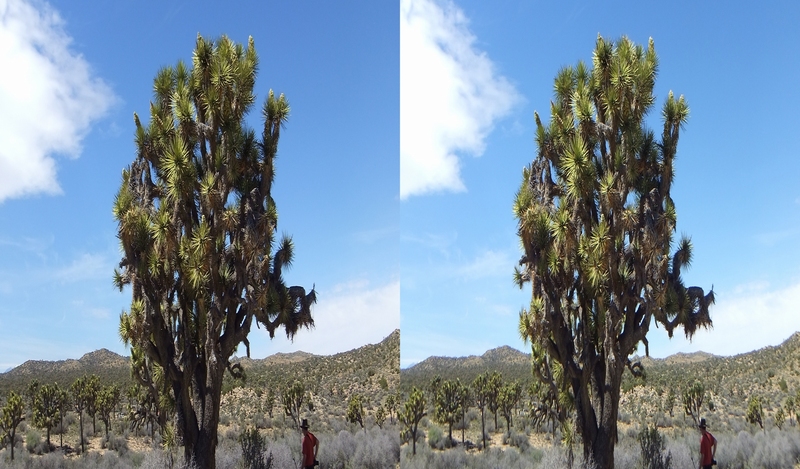 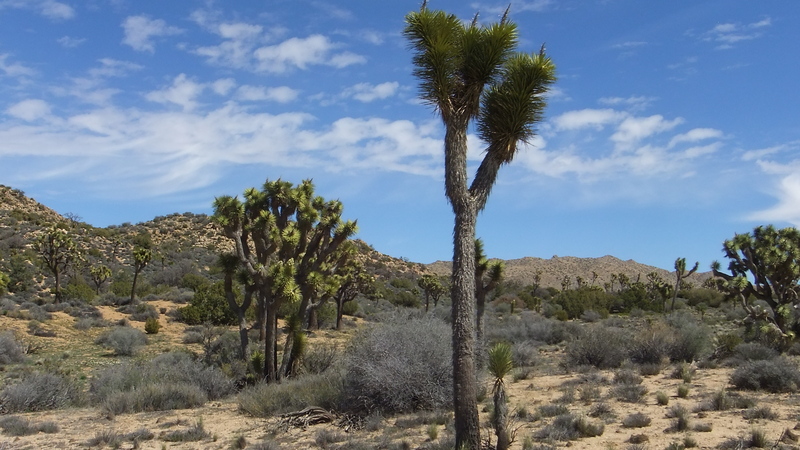 It was treat encountering so many large Joshua trees in this area; the juniper bushes were also quite large thanks to abundant moisture during the two rainy ‘seasons’ of the year, winter and summer, at this higher elevation in Joshua Tree National Park. 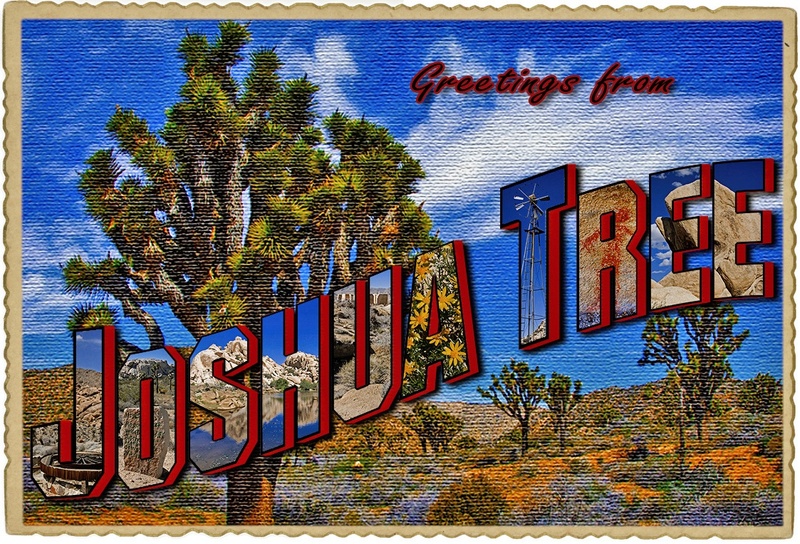 Elliot Koeppel’s Cali49.com web page is a must see if you are fascinated by California’s Gold Rush Country, Hwy 395, Joshua Tree NP, or Mojave Desert history and abandoned towns/mine sites. 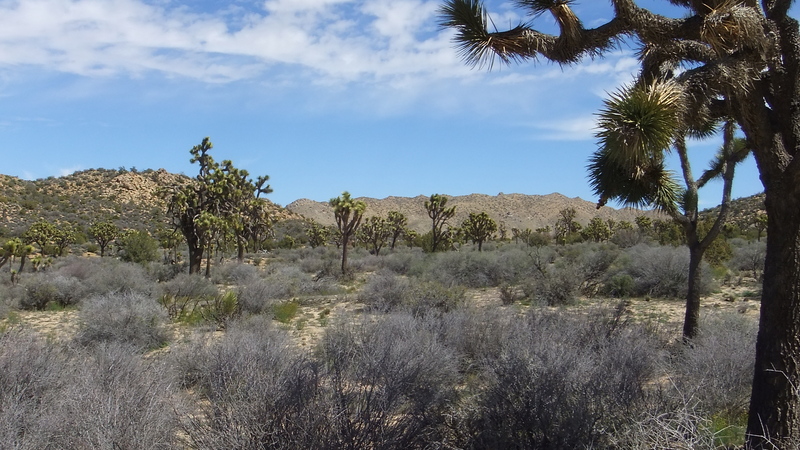 His book, The California Gold Country: Highway 49 Revisited (pub. 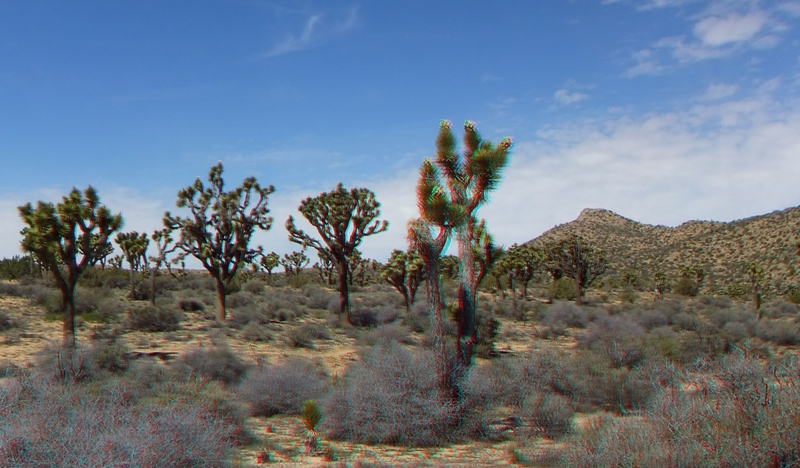 Aug 15, 1999) is available from Amazon.com. 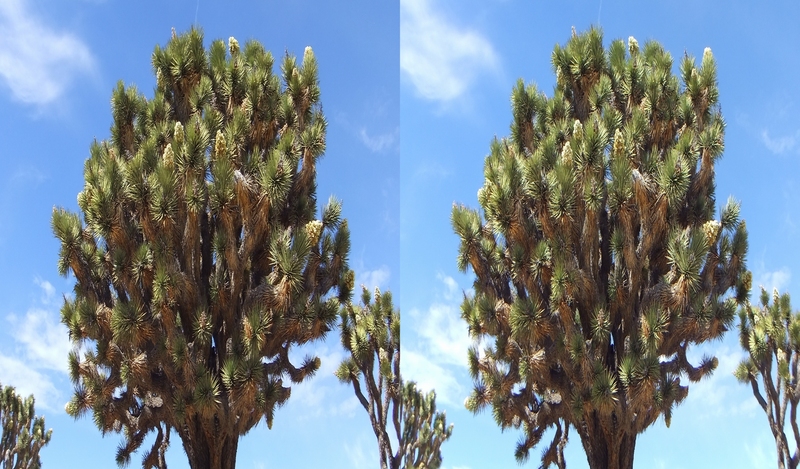 Maude. 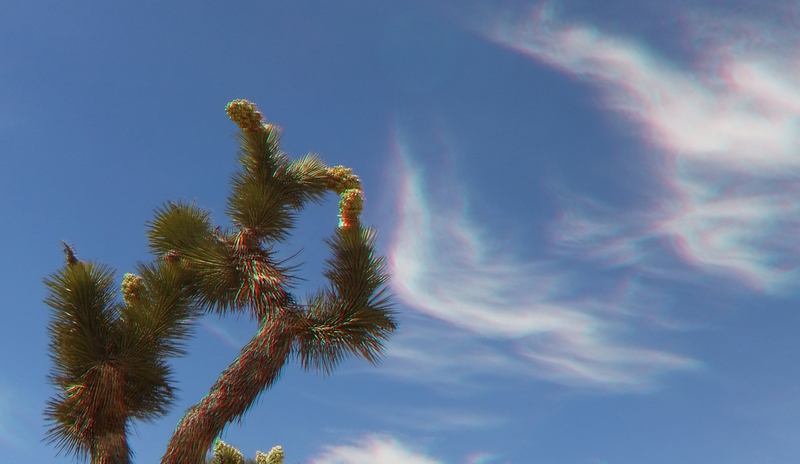 What flower would you like to be? 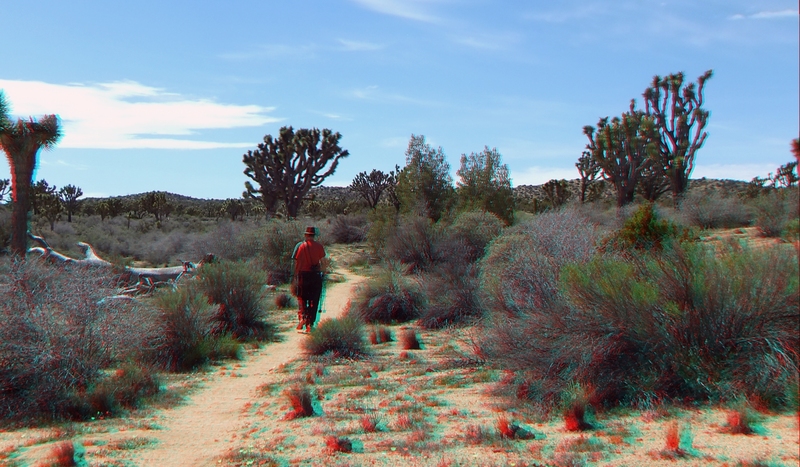 Harold. 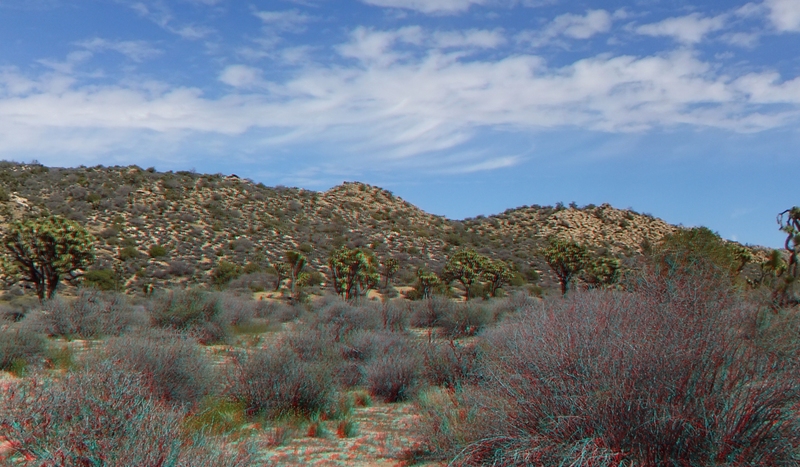 I don’t know. 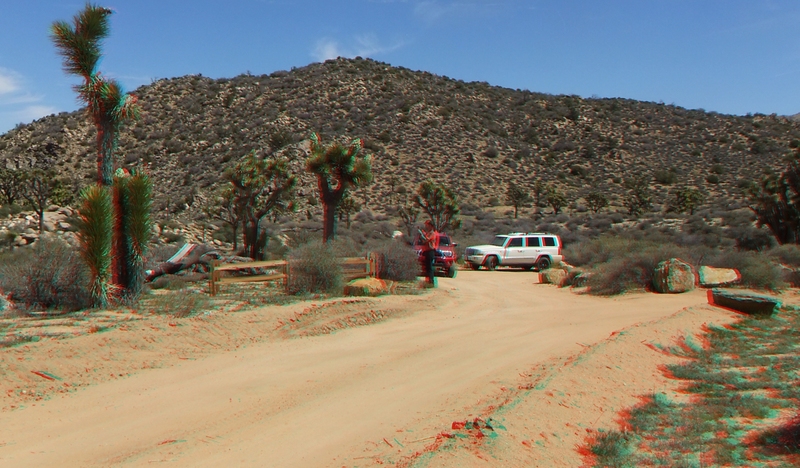 One of these maybe. 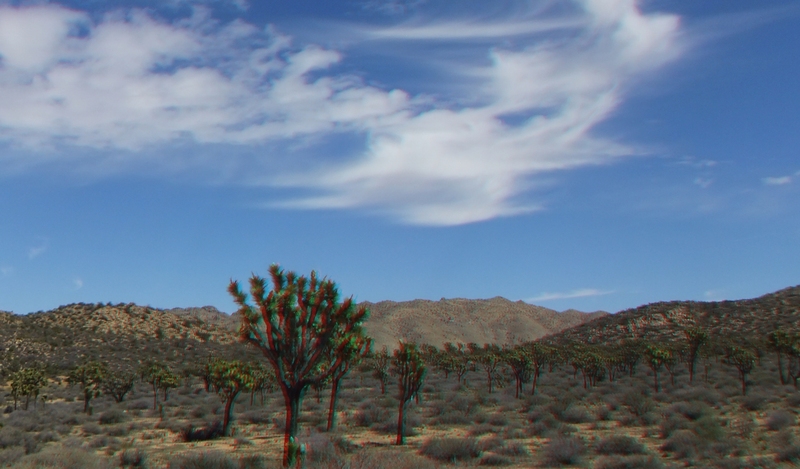 M. Why do you say that? 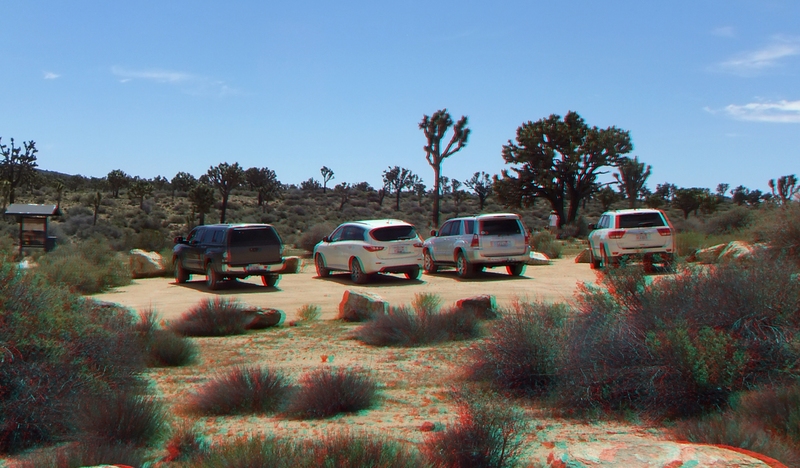 H. Because they’re all alike. 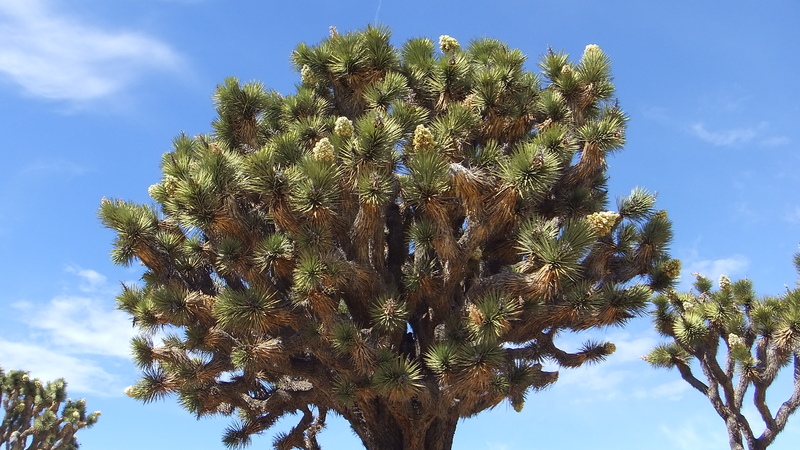 Look, see, some are smaller… some are fatter. 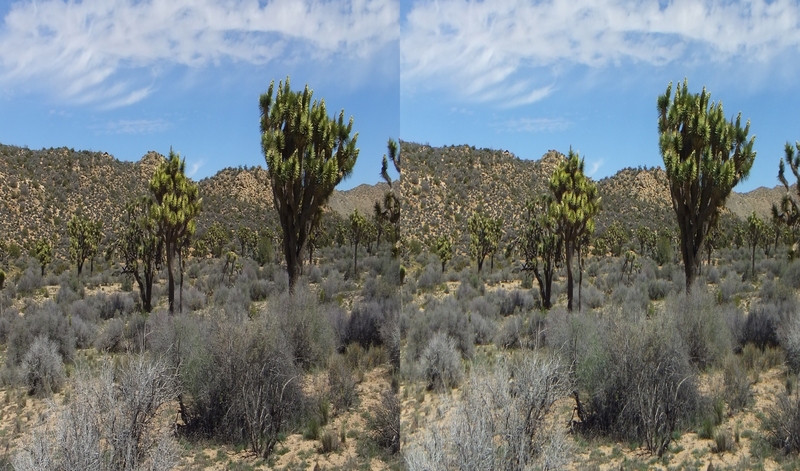 Some grow to the left… some to the right.